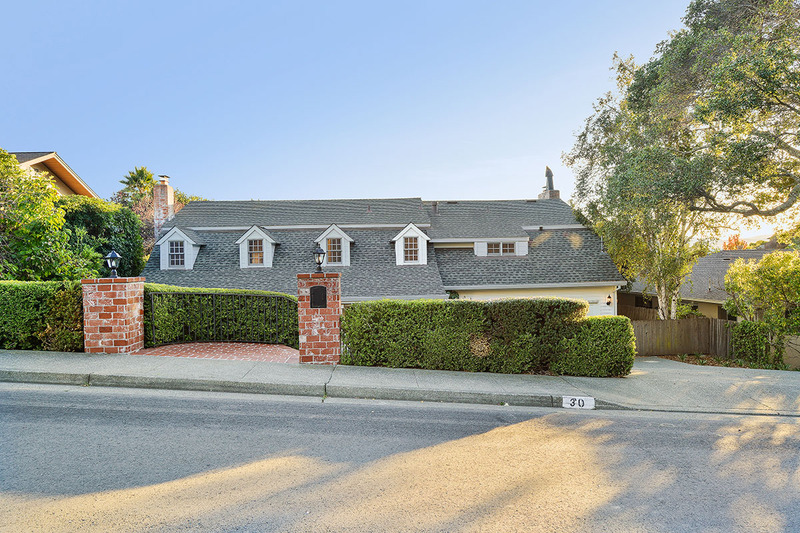 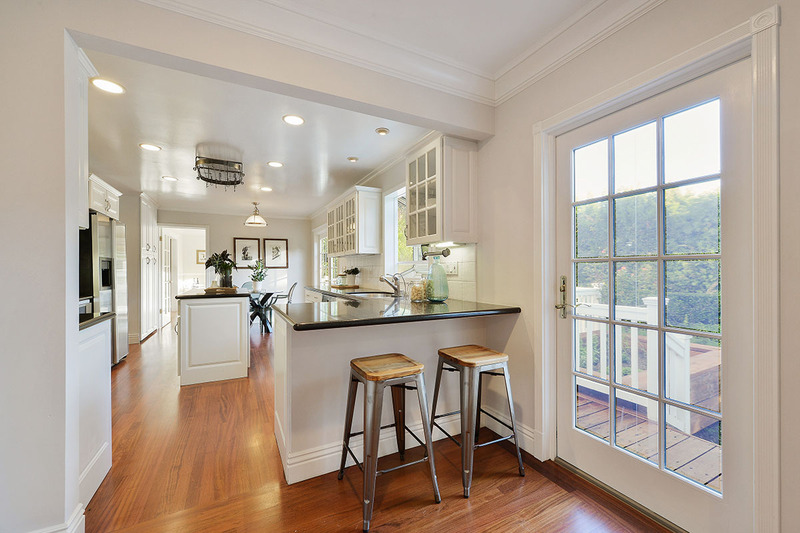 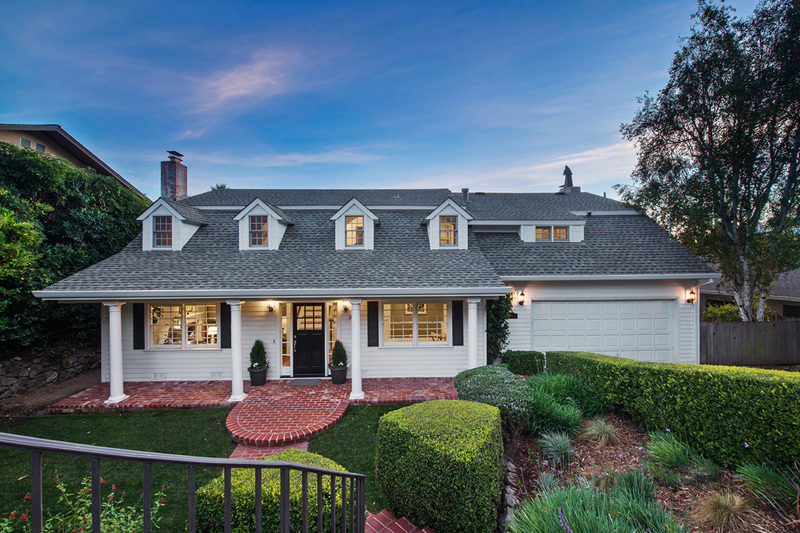 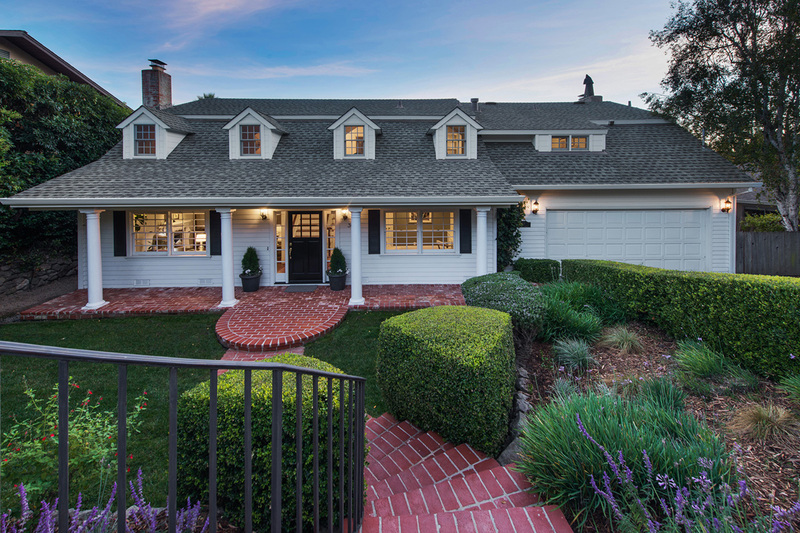 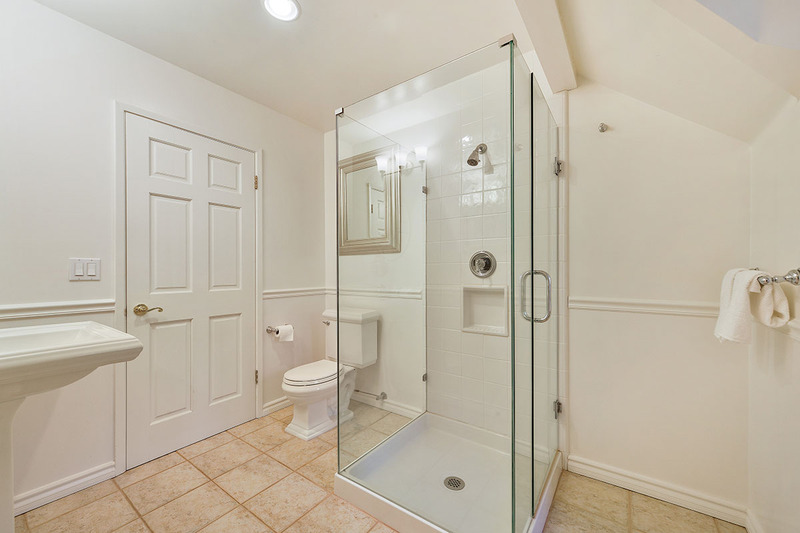 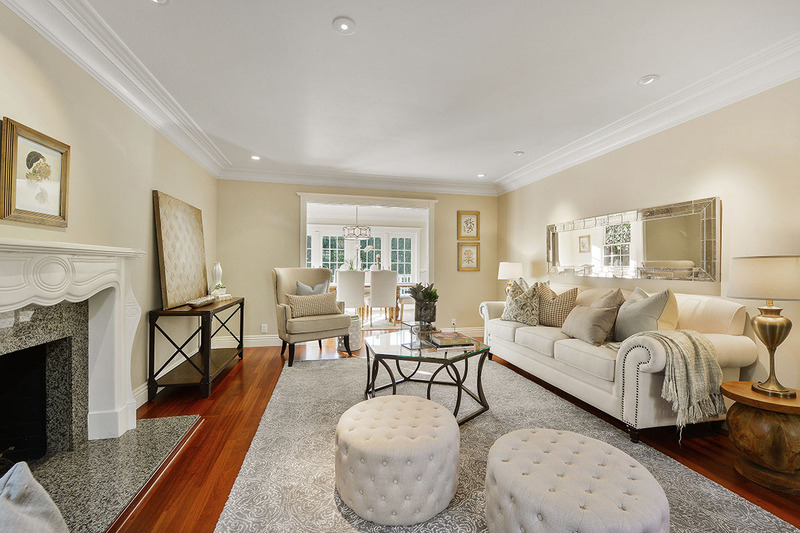 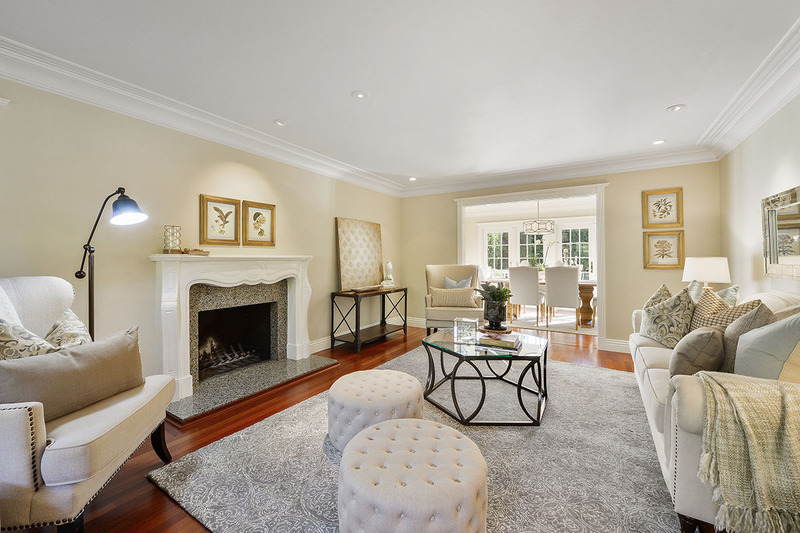 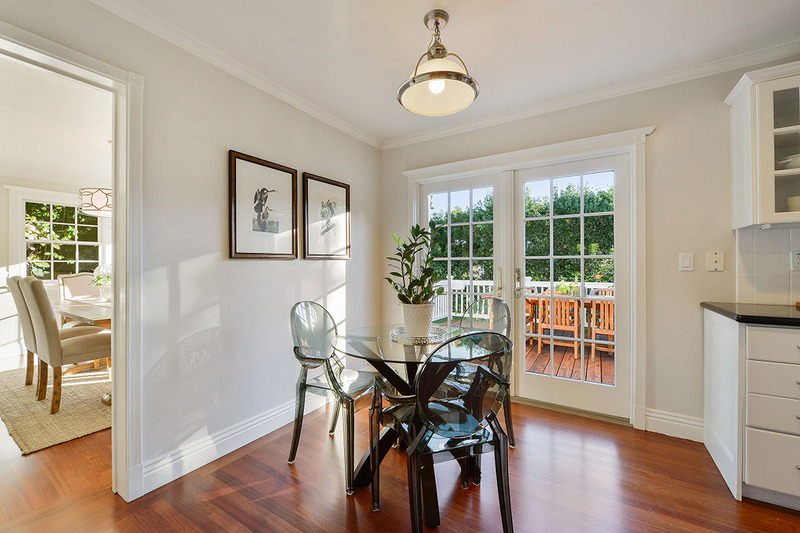 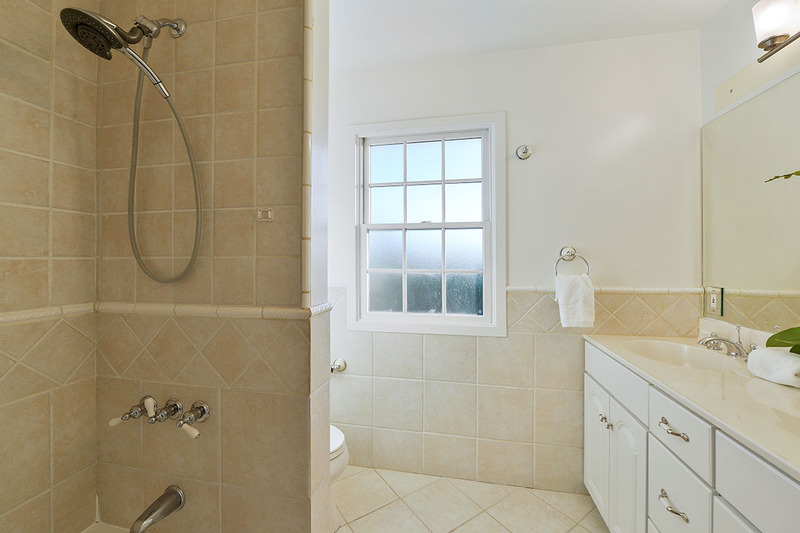 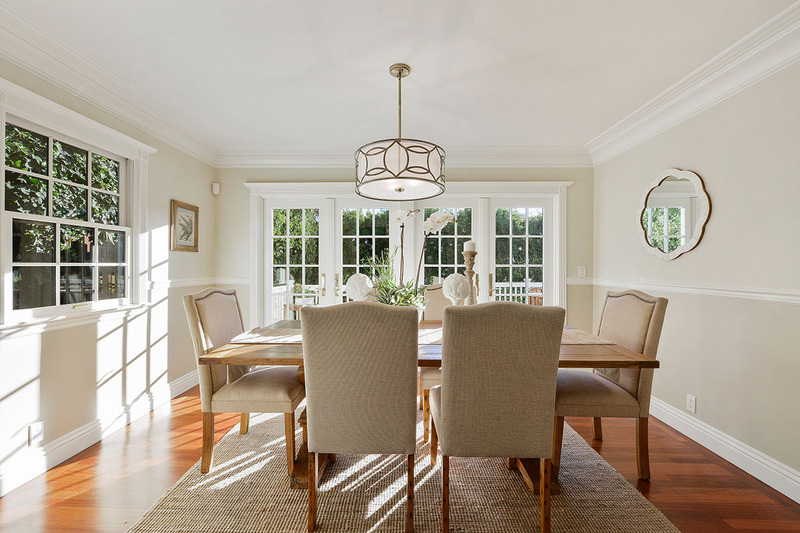 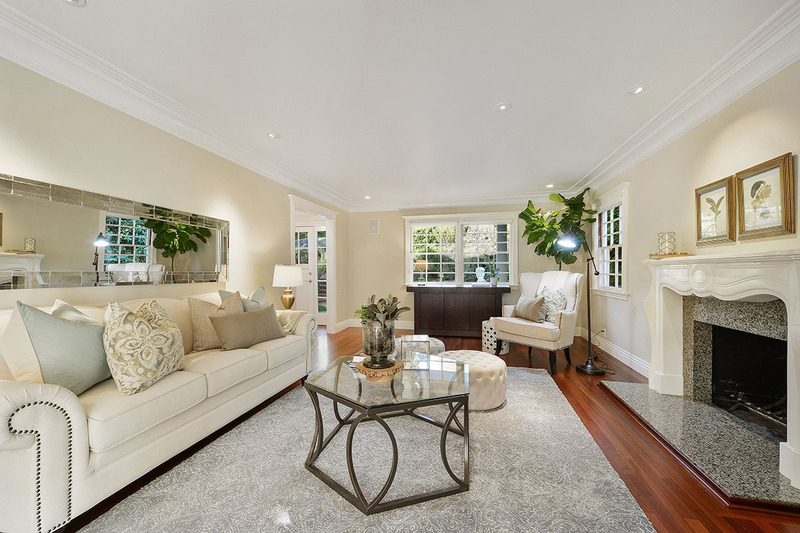 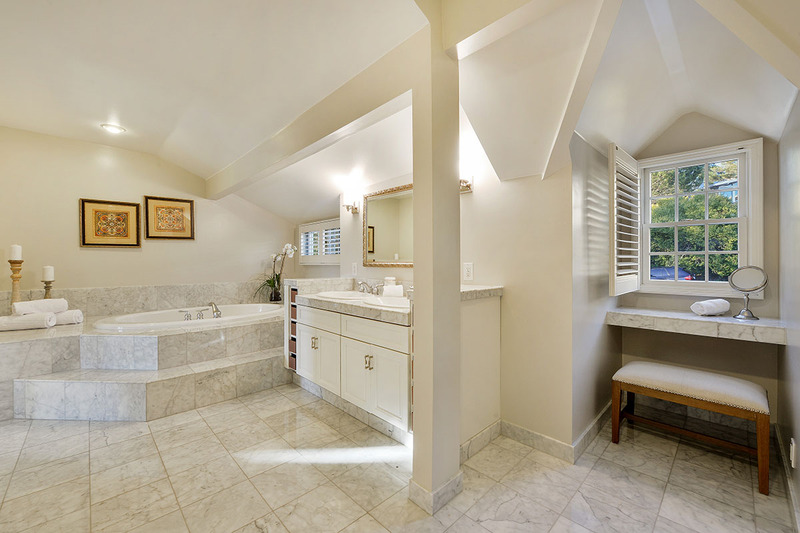 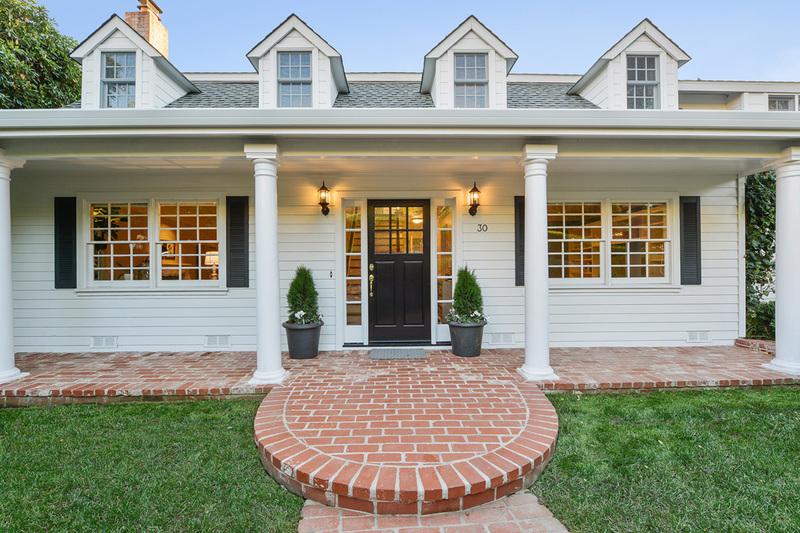 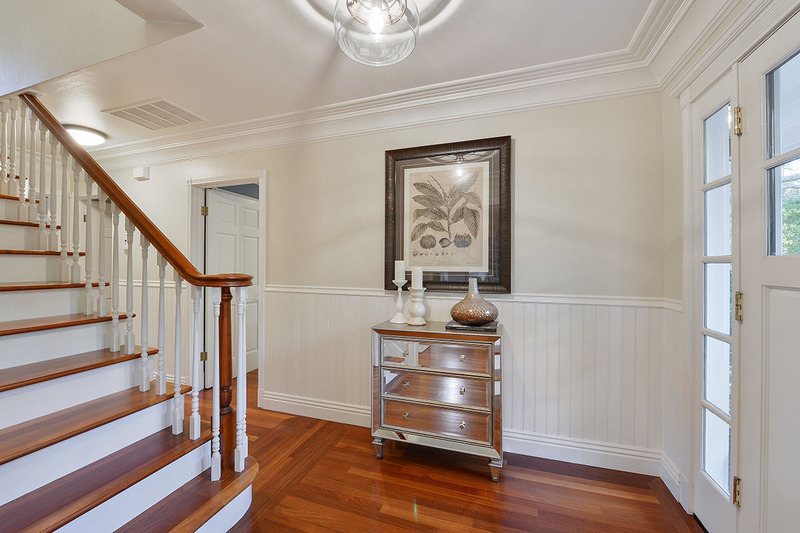 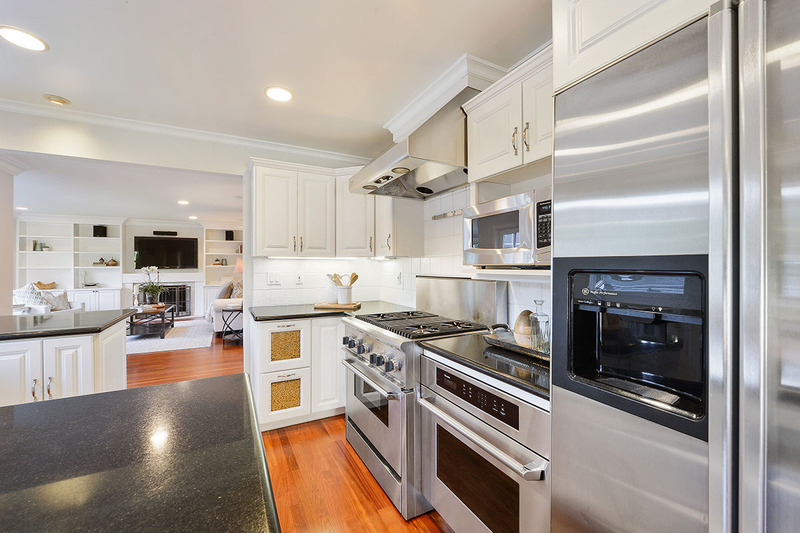 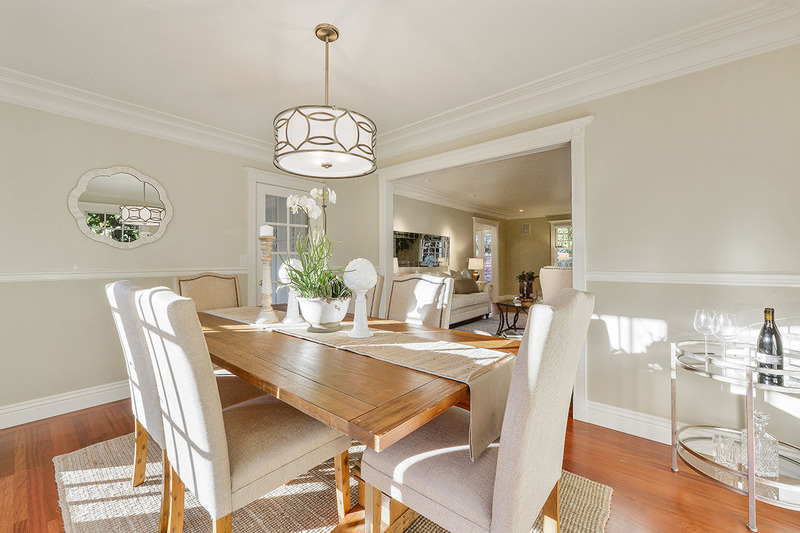 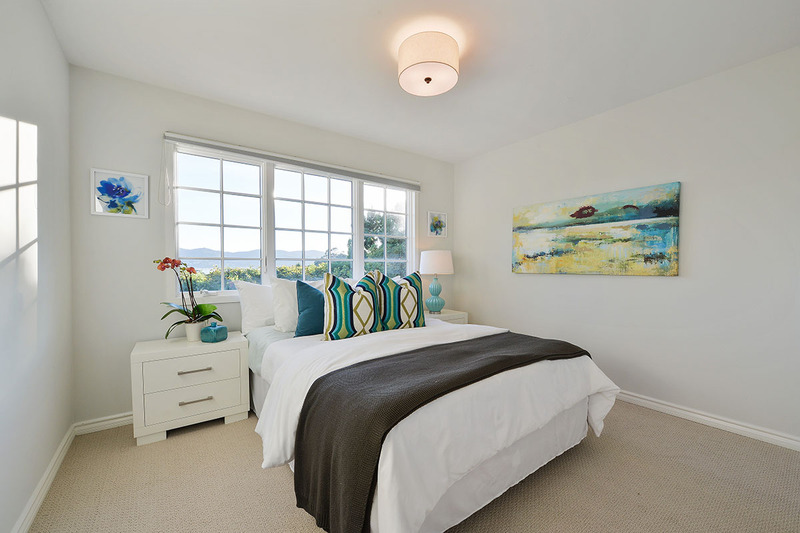 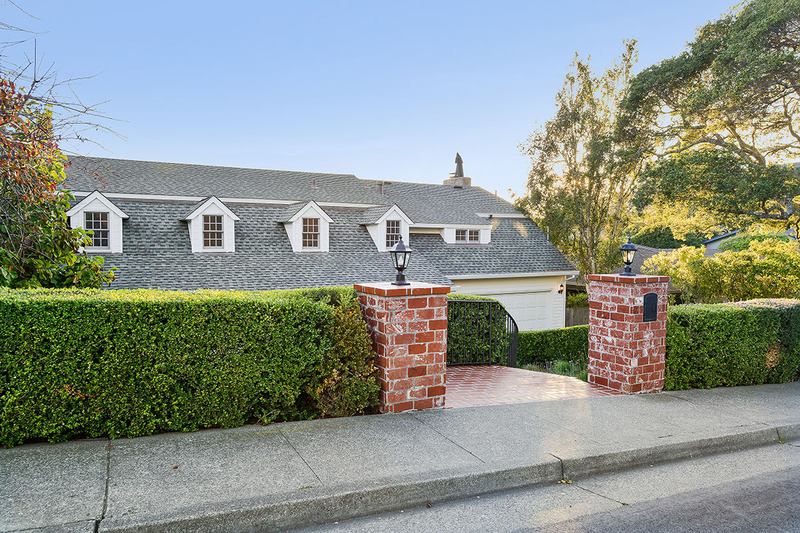 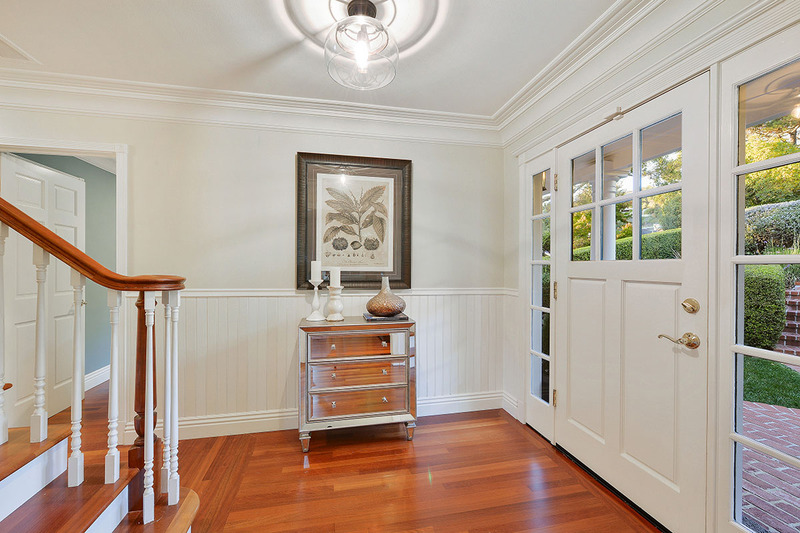 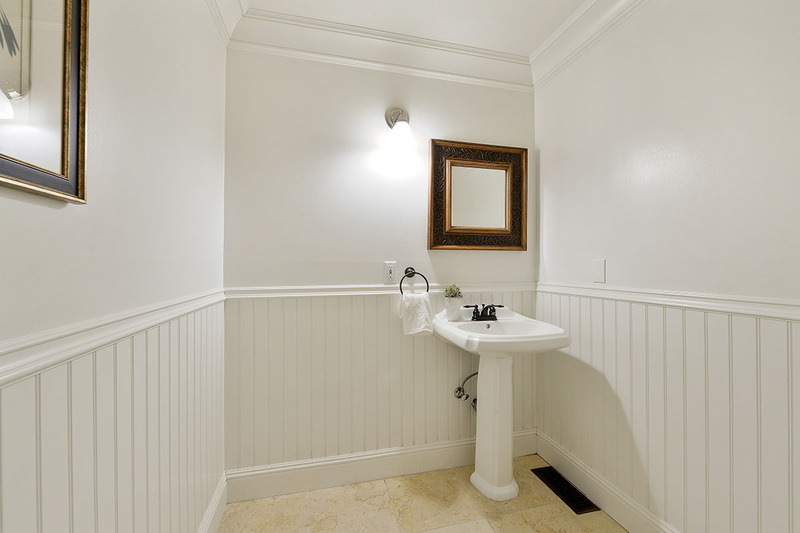 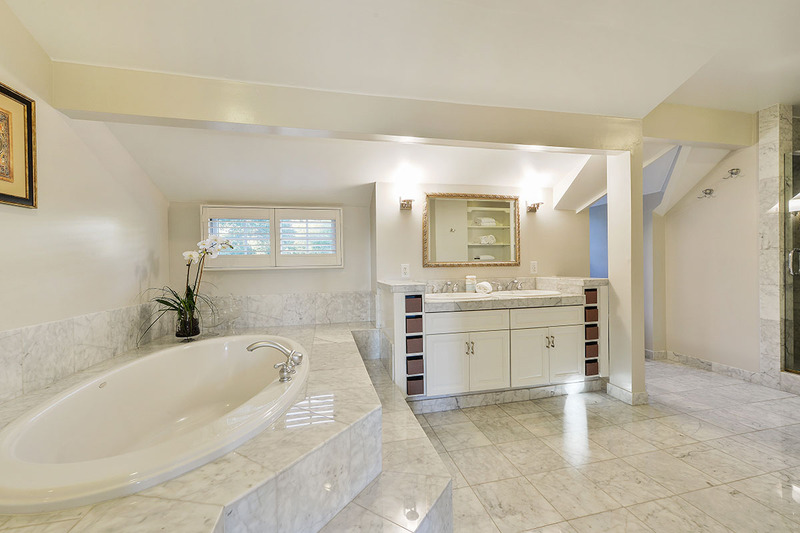 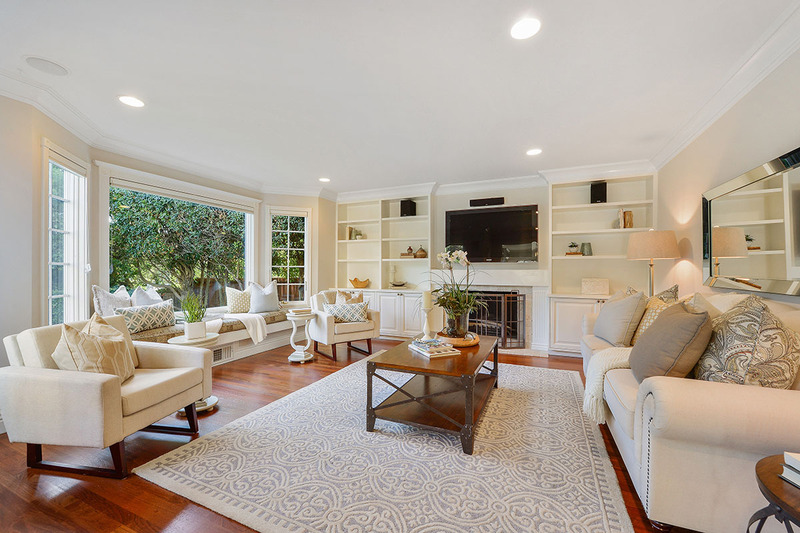 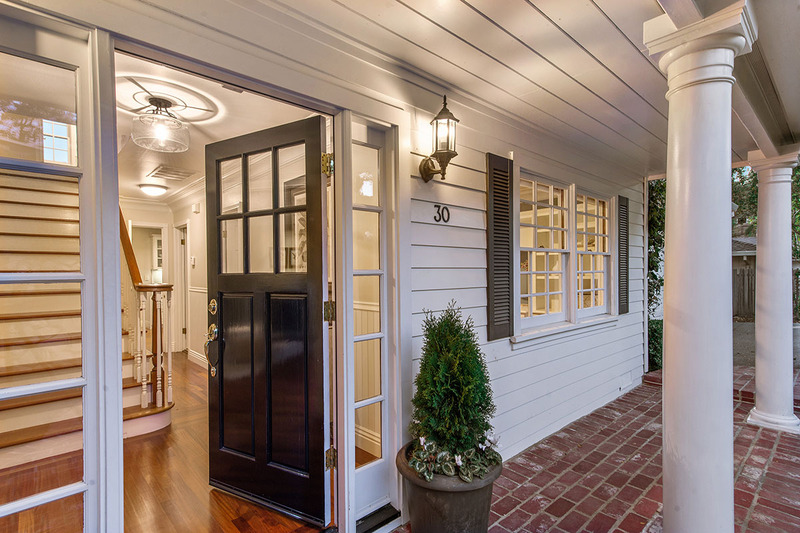 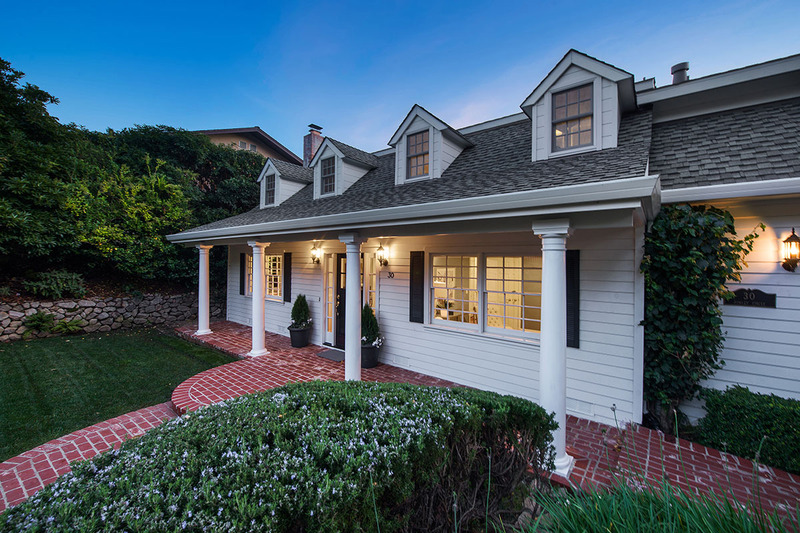 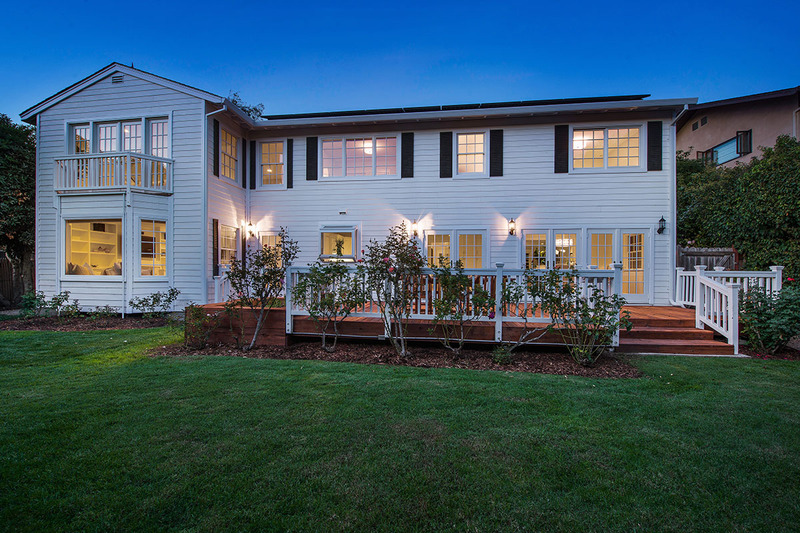 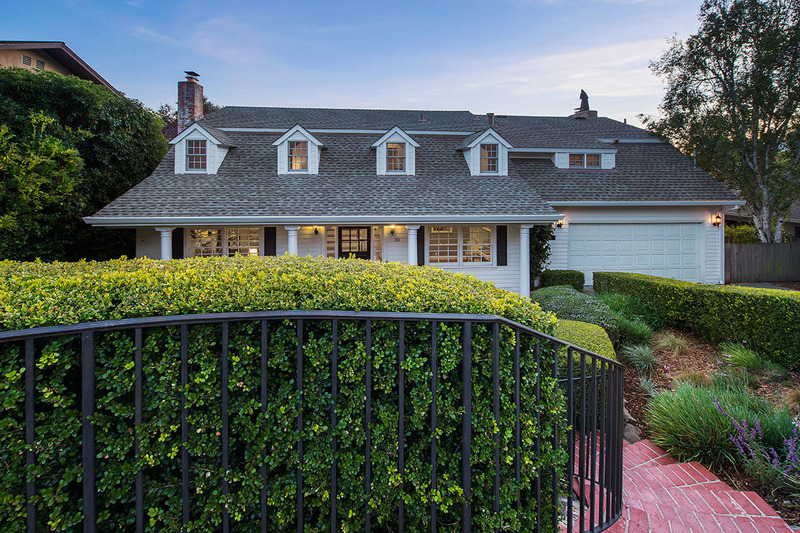 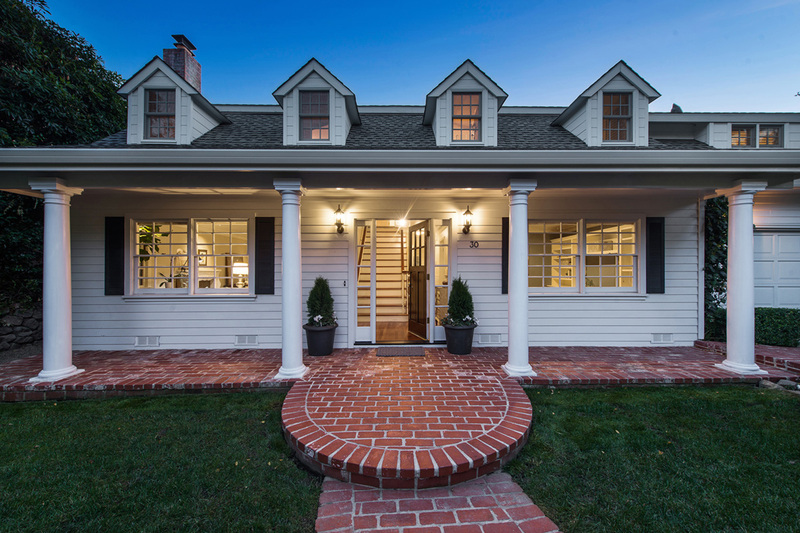 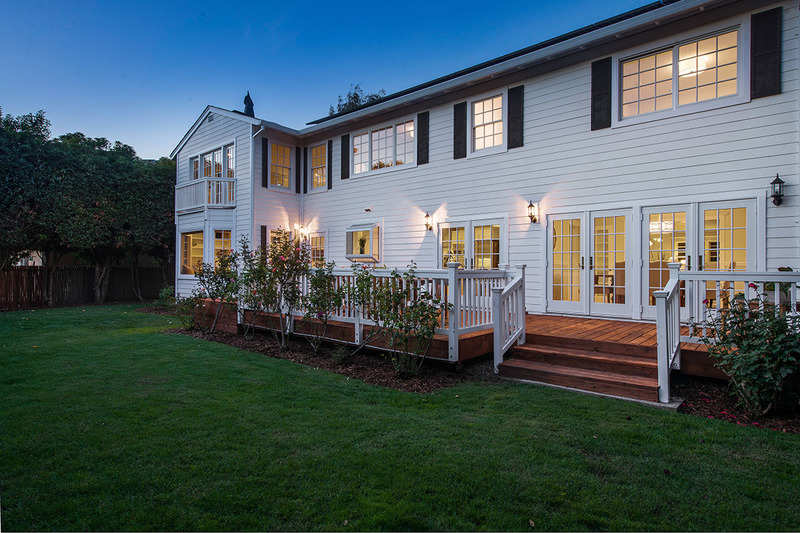 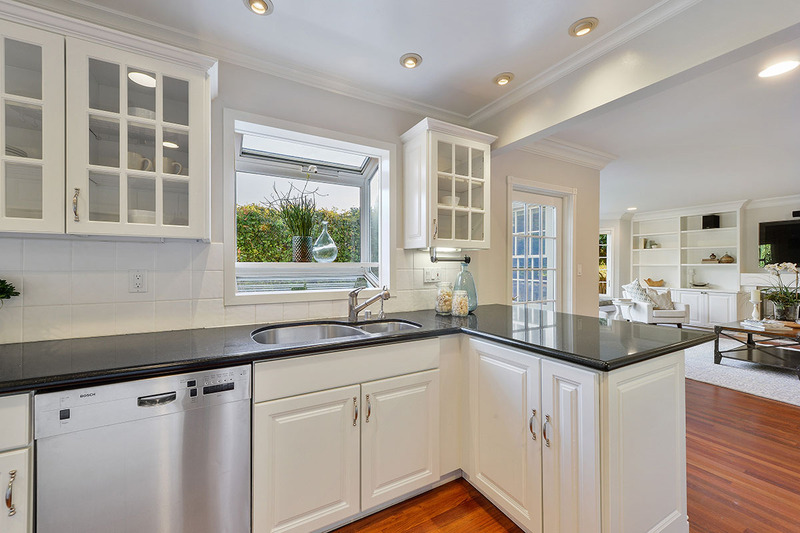 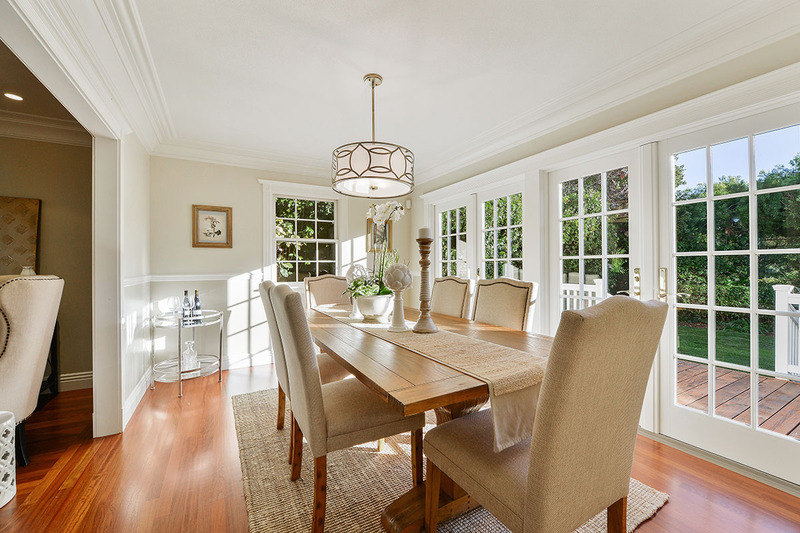 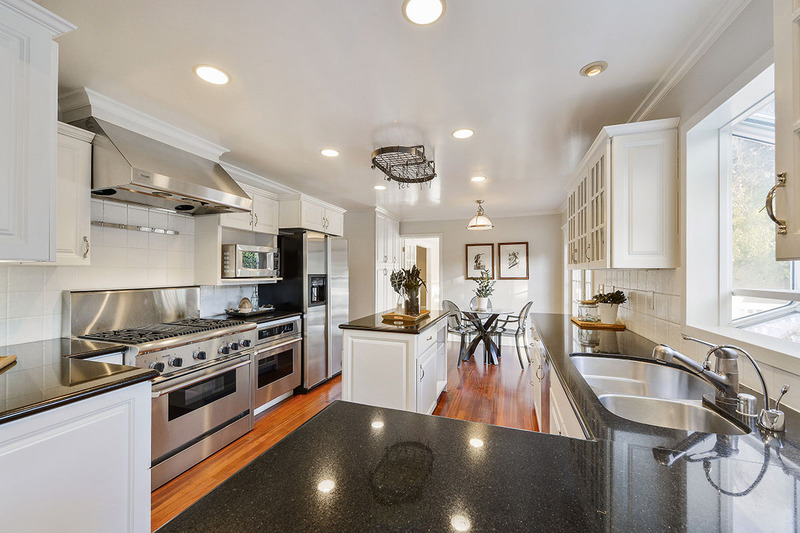 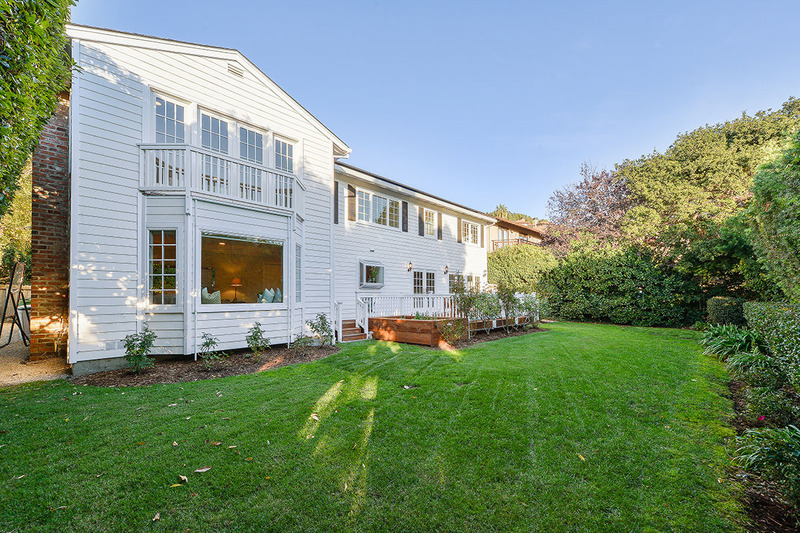 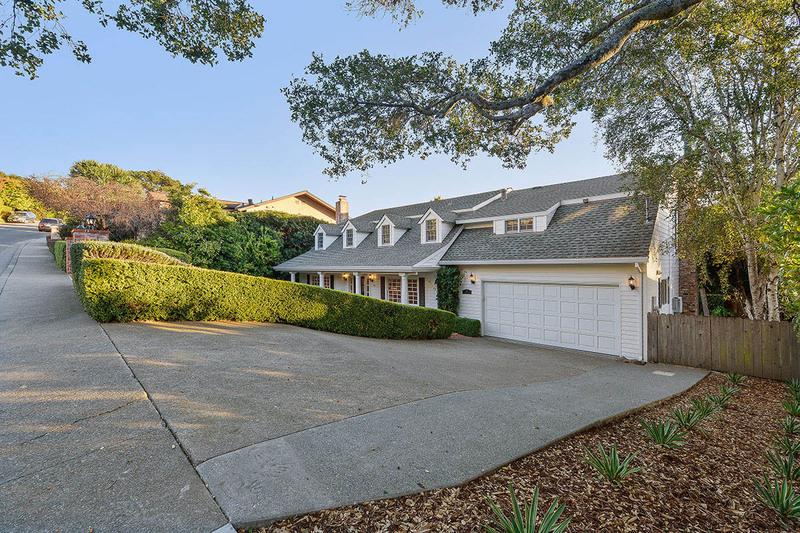 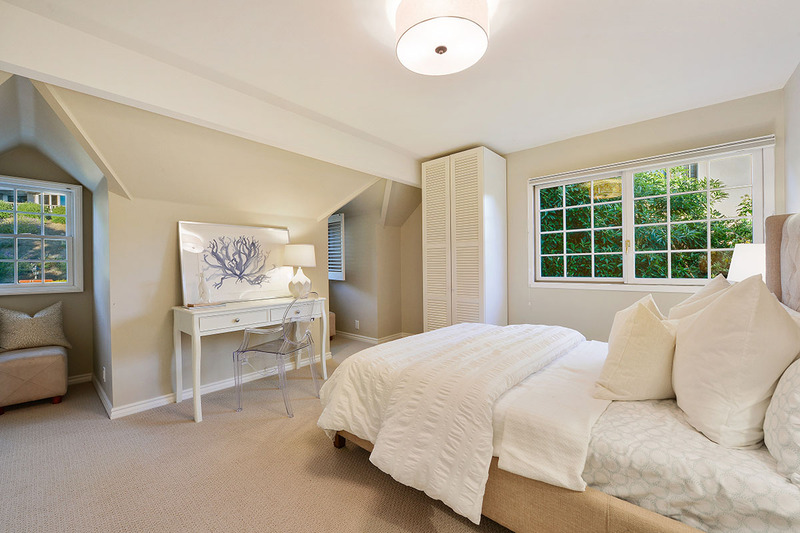 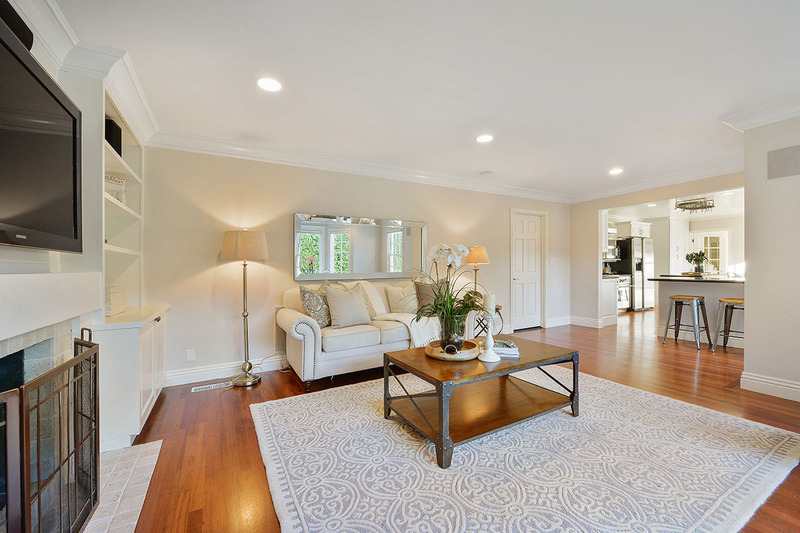 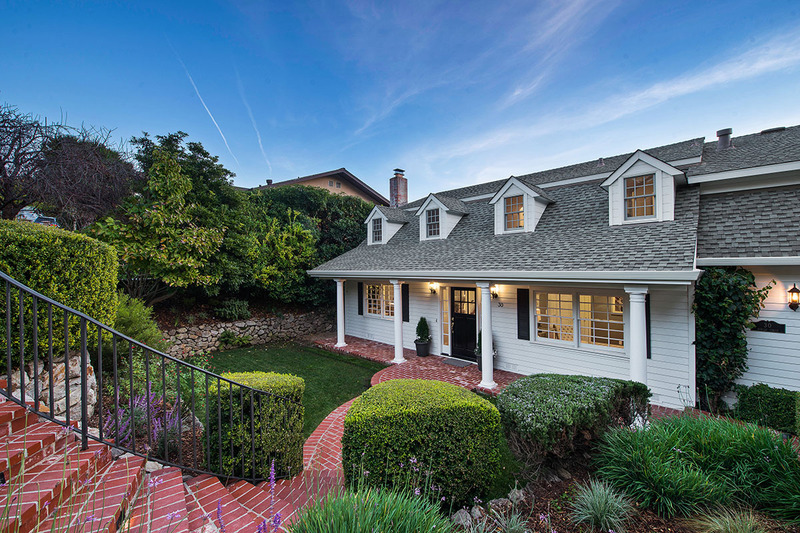 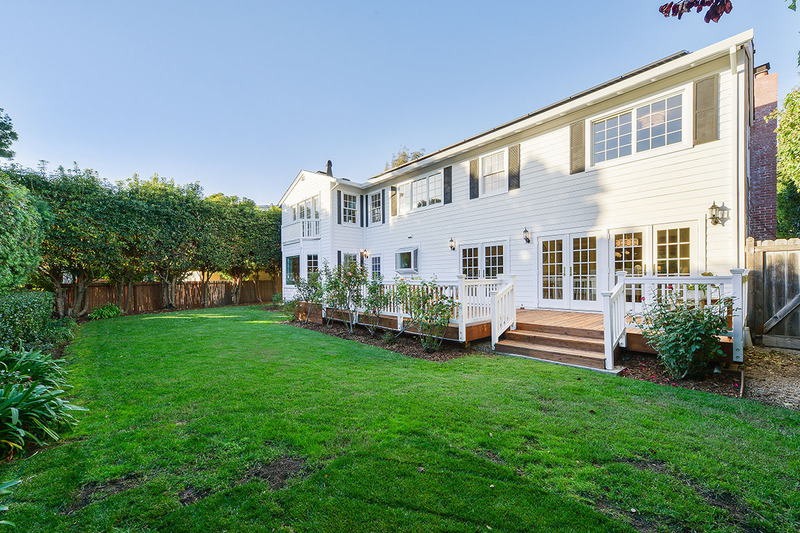 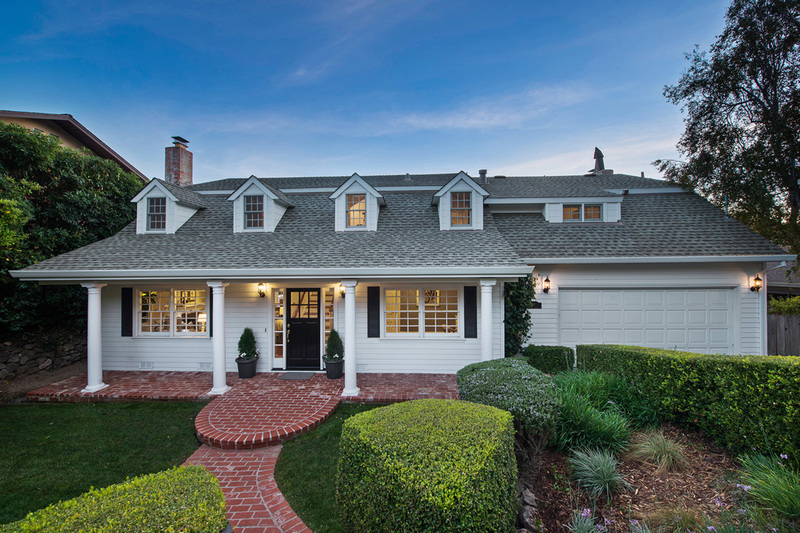 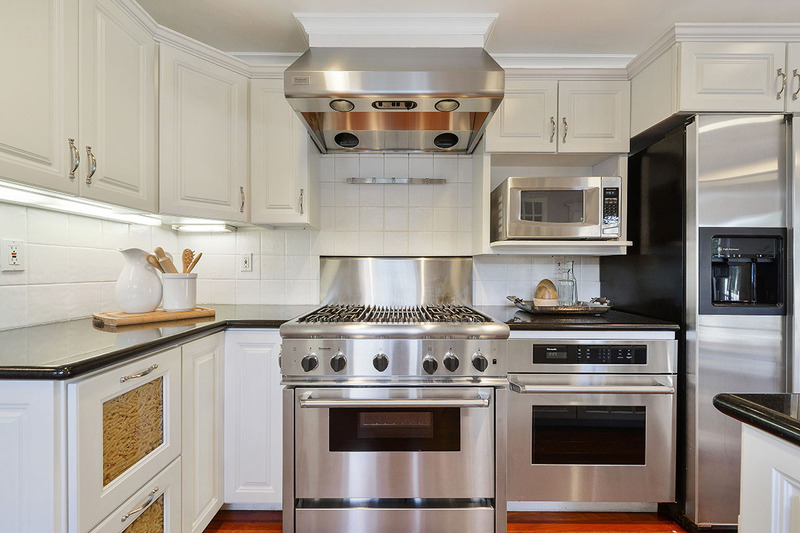 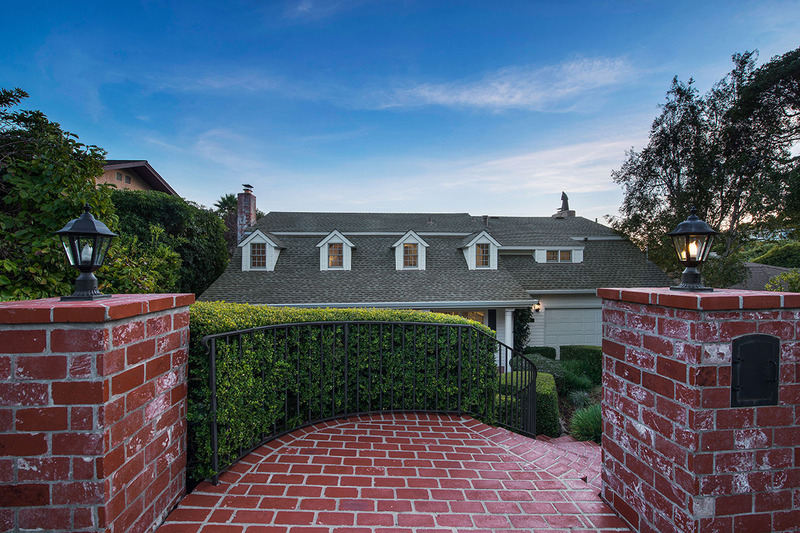 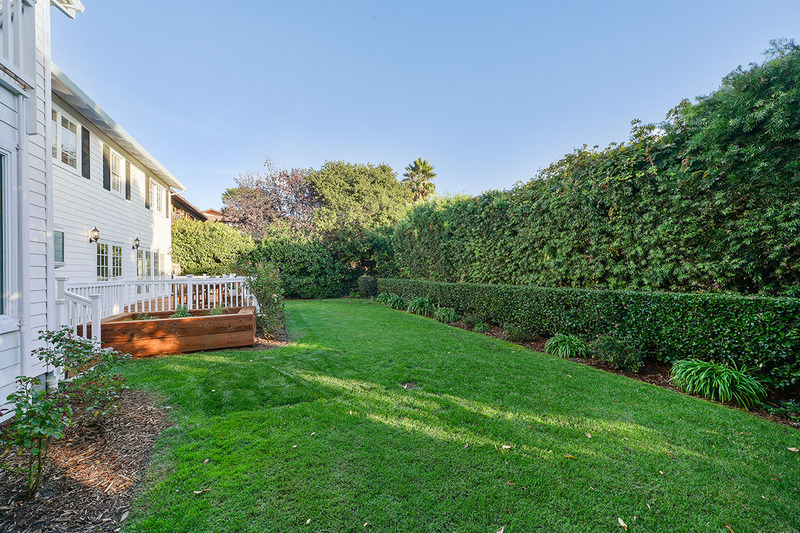 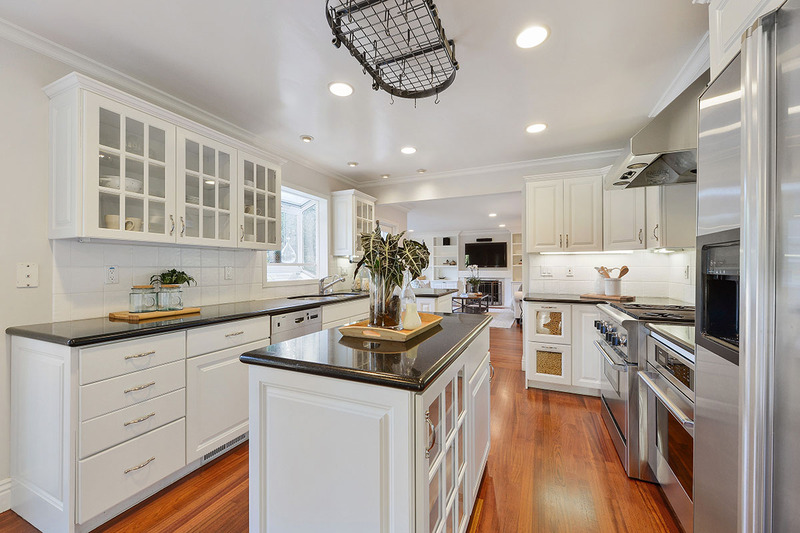 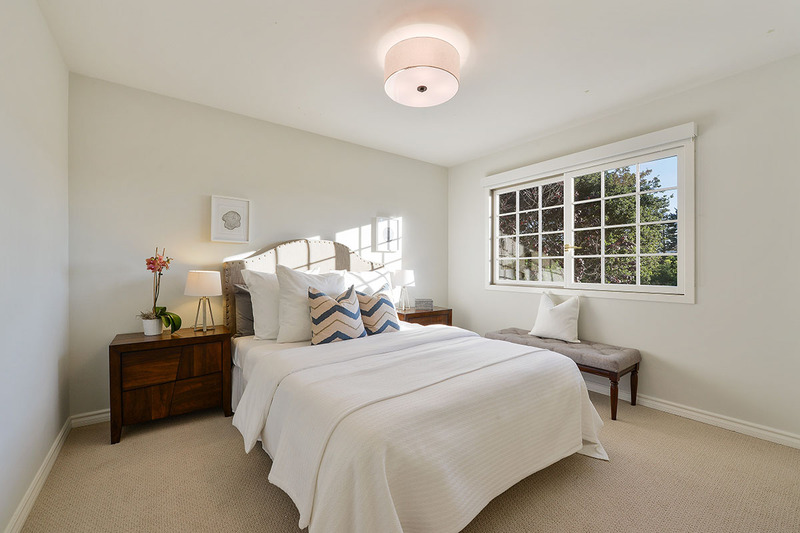 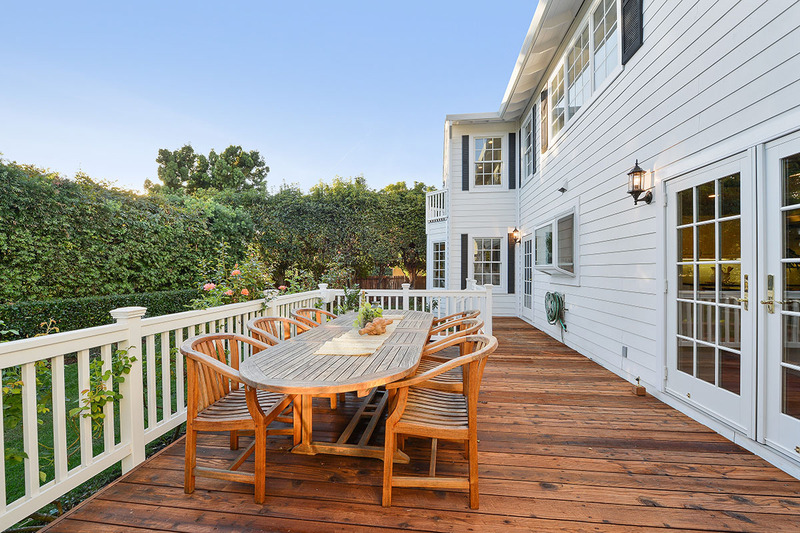 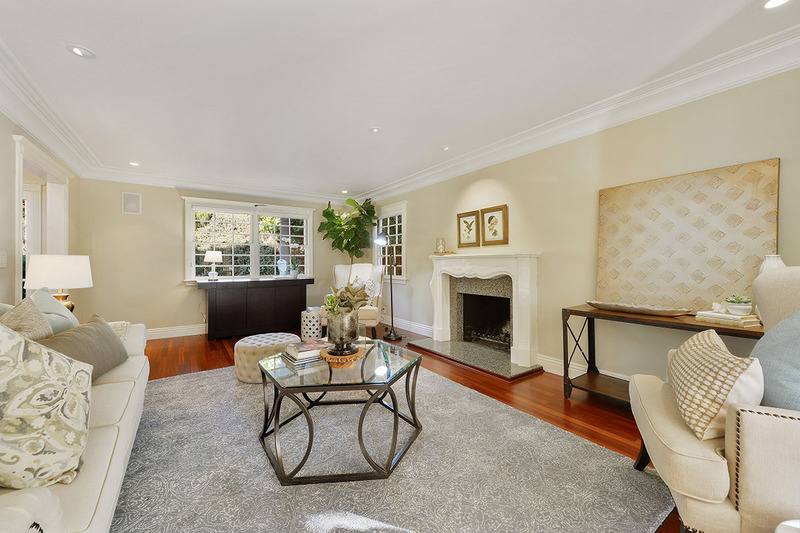 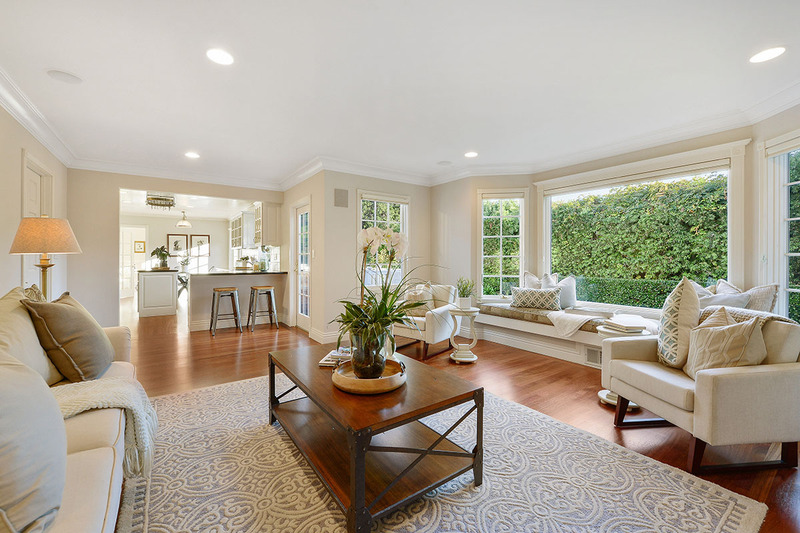 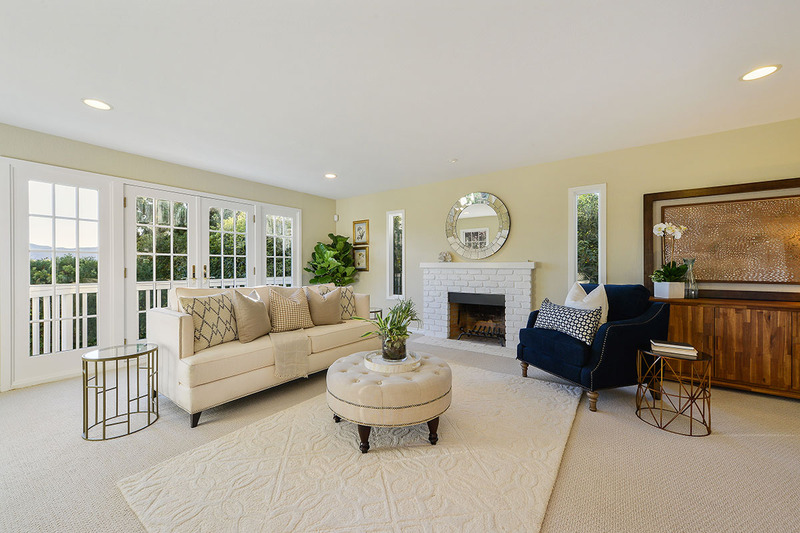 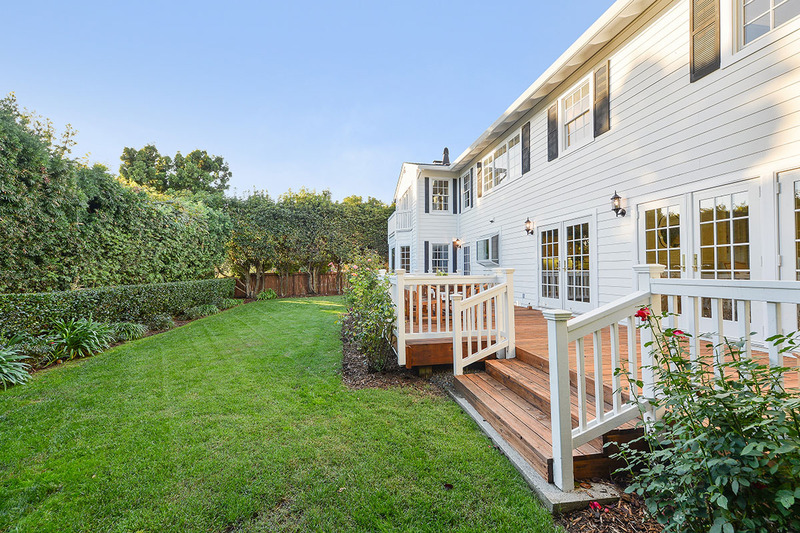 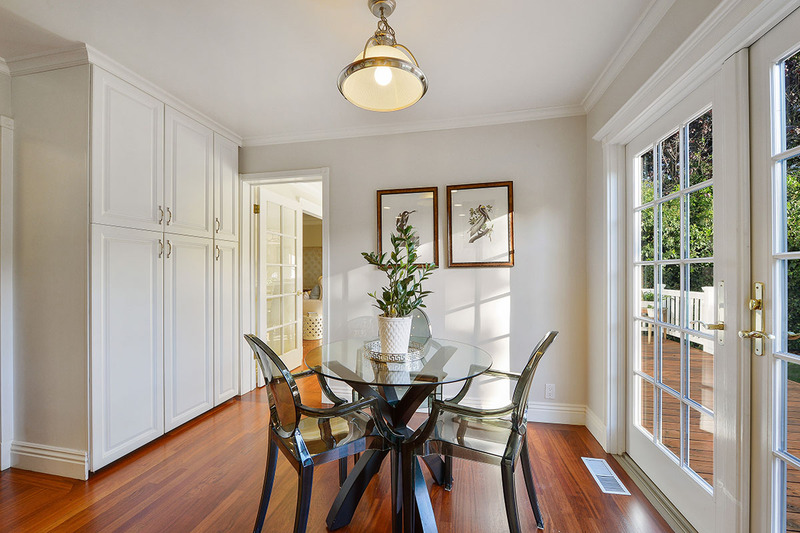 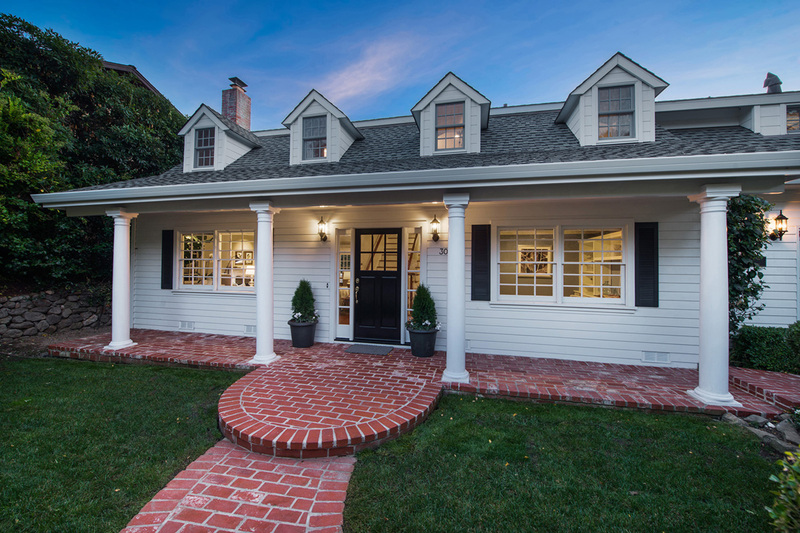 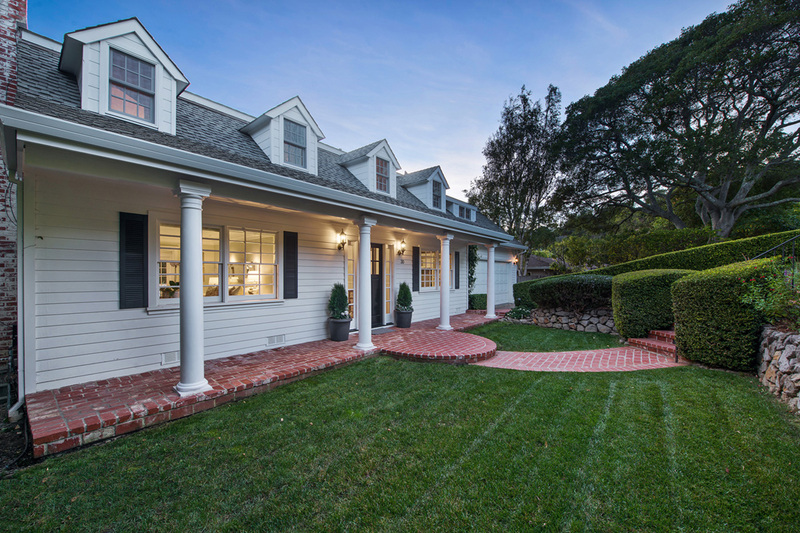 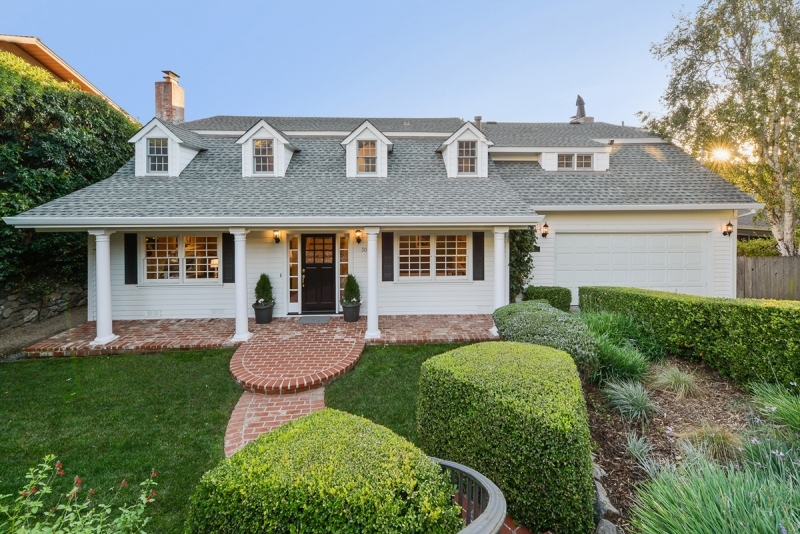 30 Rowley Circle is a lovingly remodeled and maintained, approximately 3100 square foot, four or five bedroom, three and a half bath Cape Cod style Tiburon home, in the immediate vicinity of Del Mar school. 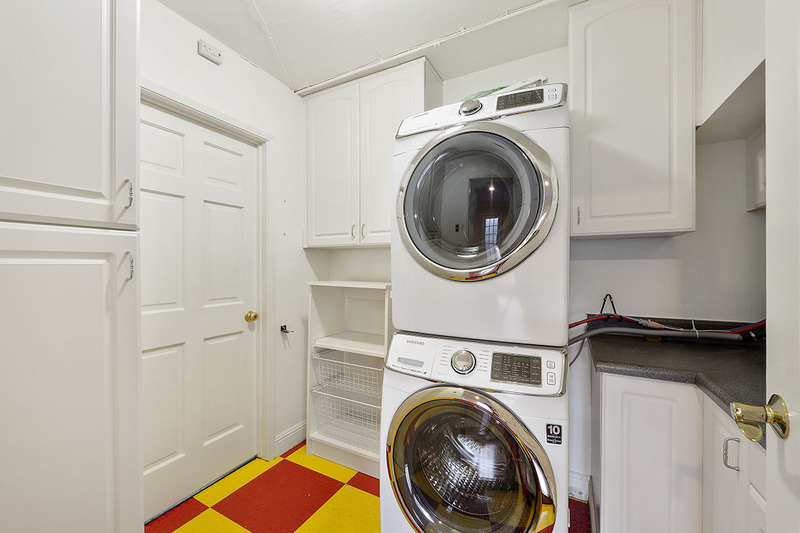 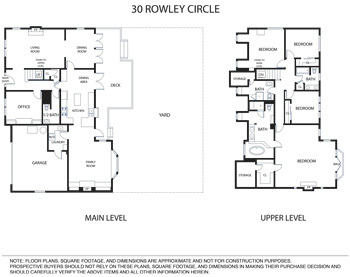 This updated and upgraded two-story floor plan includes a large living room, formal dining room, eat-in chef's kitchen, family room, powder room, and office / bedroom, as well as a laundry room, and attached garage on the ground floor, and three bedrooms, two full bathrooms, plus a spacious master suite with marble master bath, and French doors leading to a west facing balcony, on the upper floor. 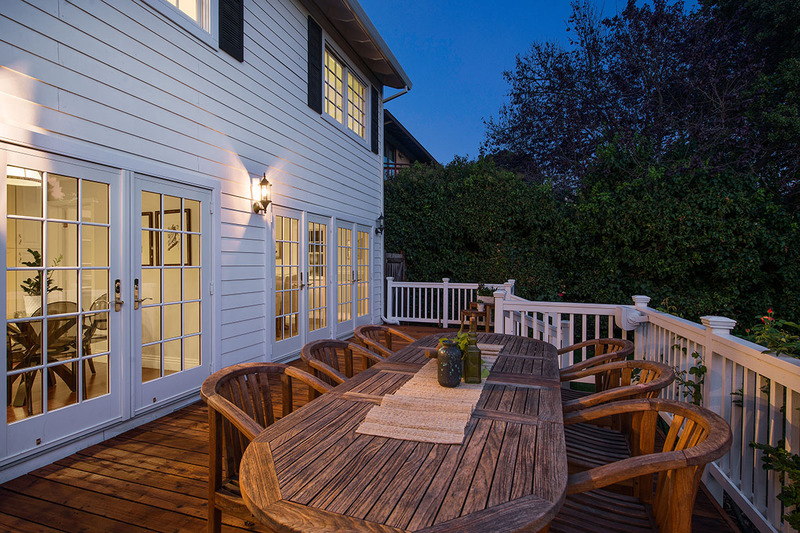 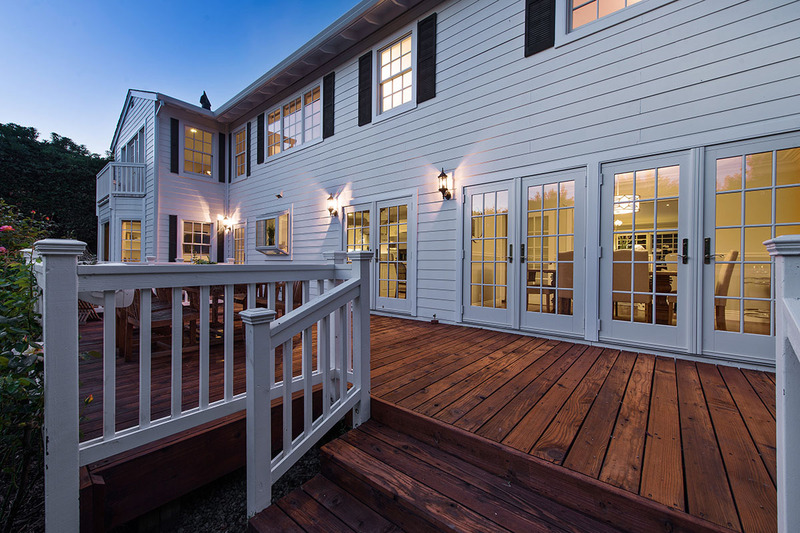 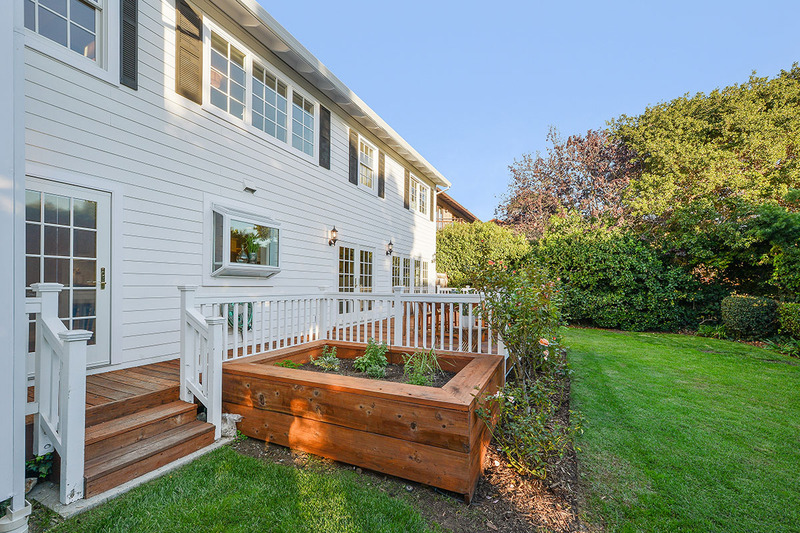 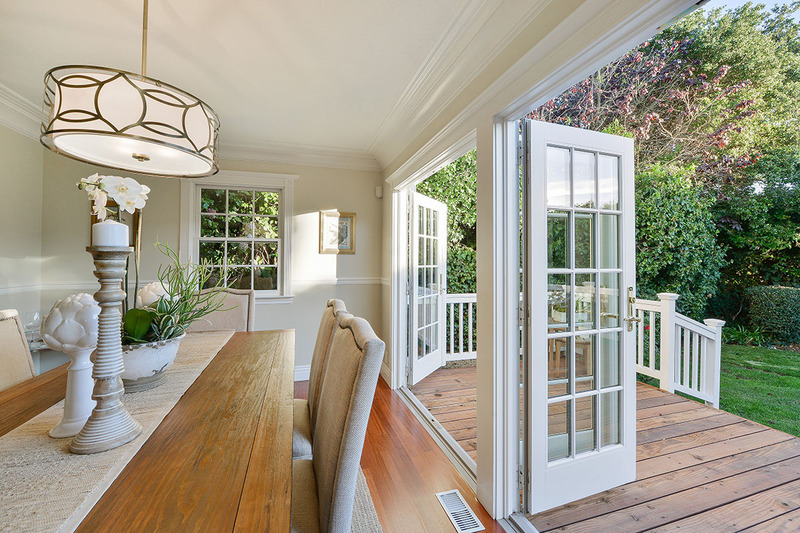 The flat, private backyard enjoys mature landscaping, large lawn area, rose and herb garden, and a redwood deck with direct access from the dining room, kitchen, and family rooms,creating a wonderful flow for indoor/outdoor living. 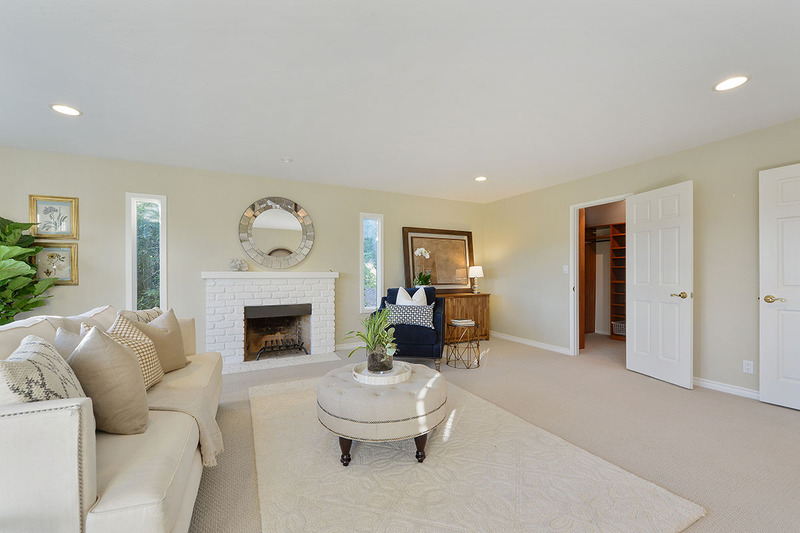 With three fireplaces and partial Bay views from the second story, this is the home you have been waiting for! 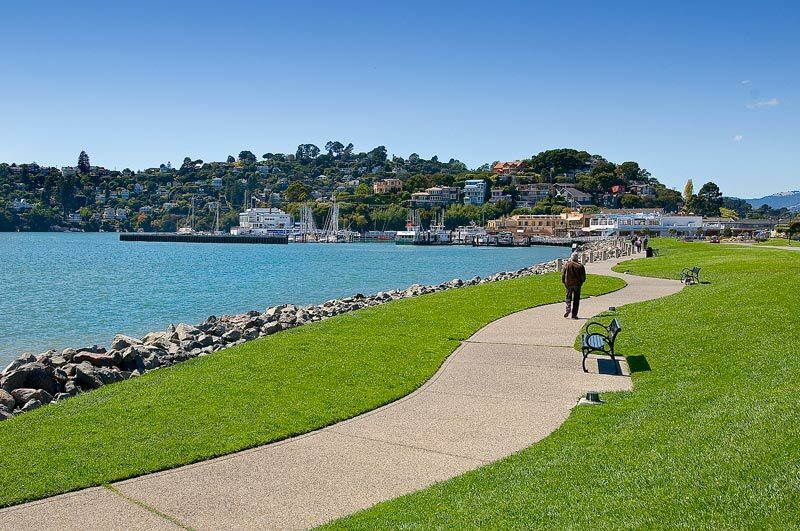 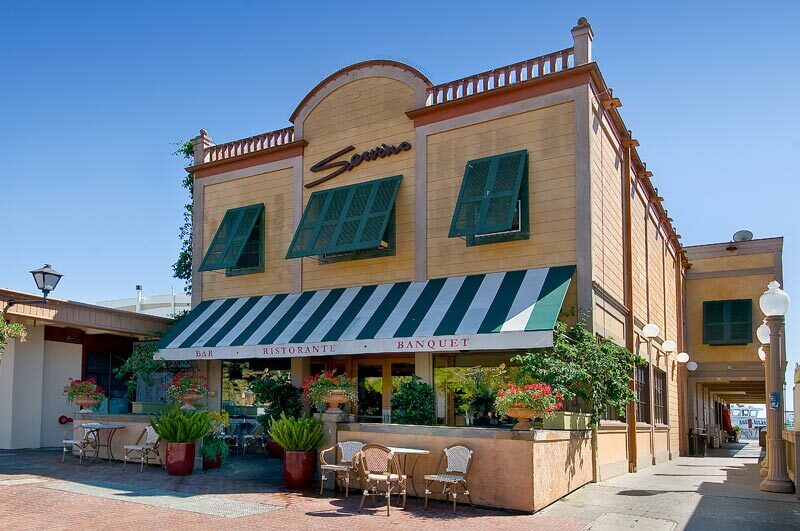 On a breathtaking peninsula jutting prominently into the San Francisco Bay, Tiburon is among the Bay Area’s most enchanting waterfront communities. 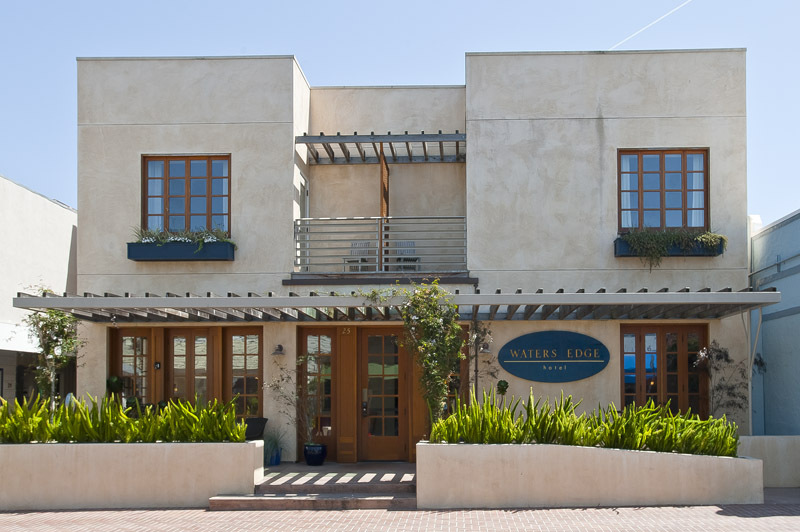 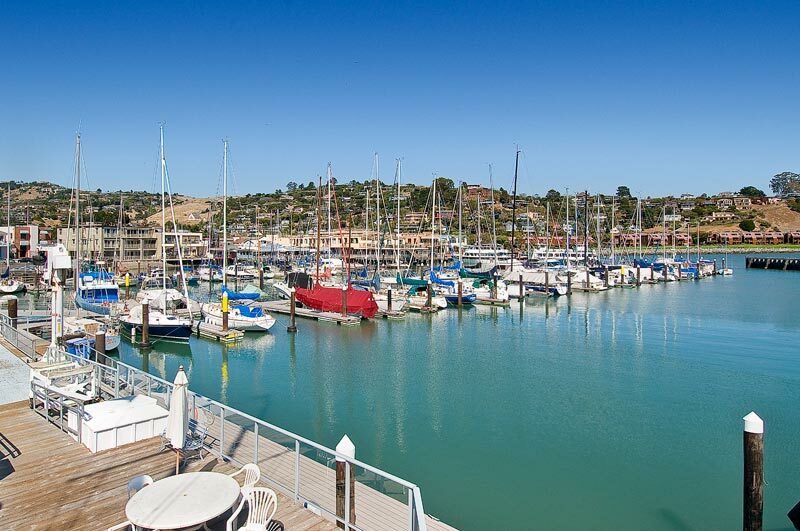 Its quaint downtown, award winning schools, sunny slopes, and easy access to San Francisco, make it a prime destination for individuals and families seeking the Good Life. 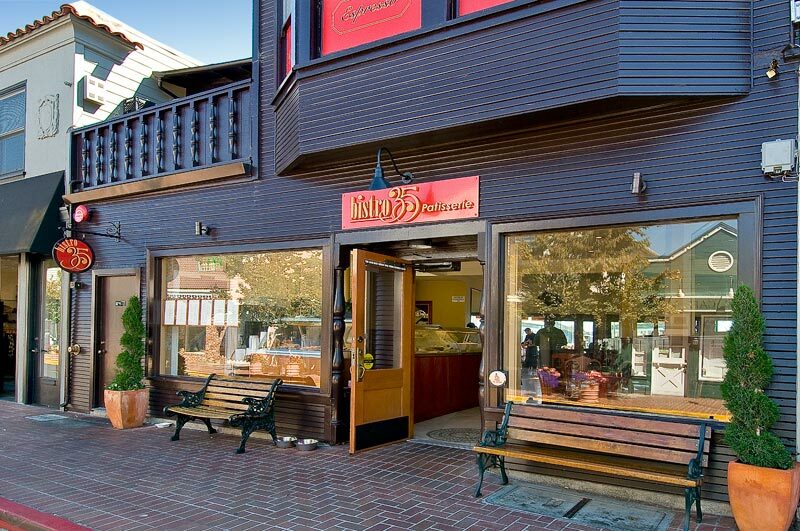 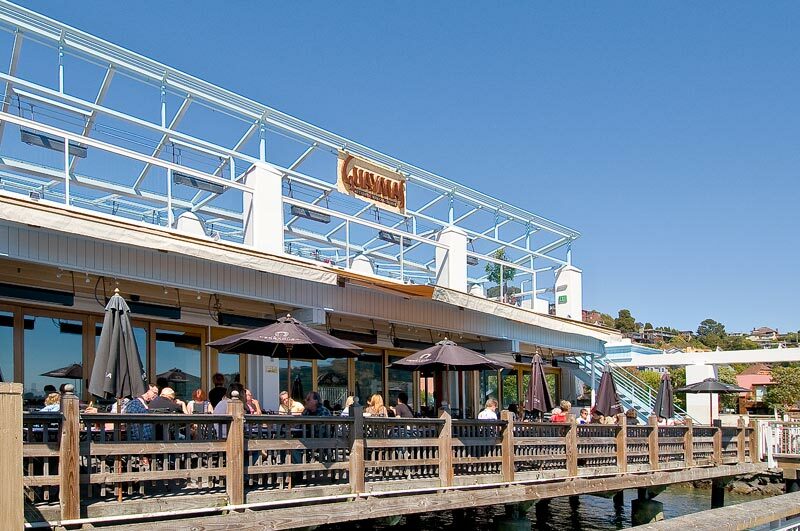 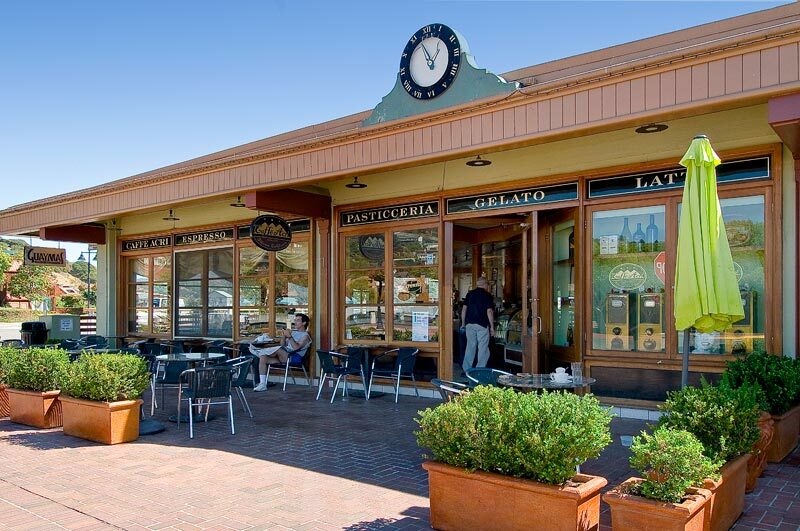 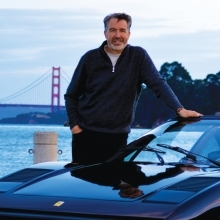 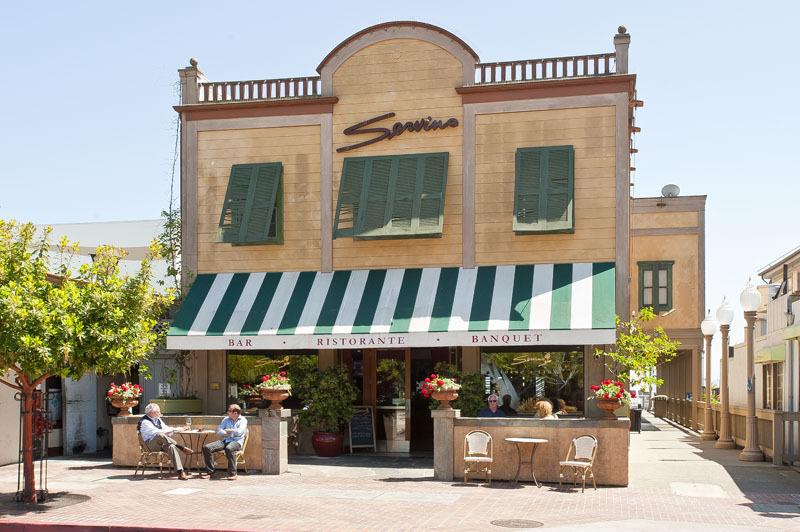 Though the town has fewer than 10,000 residents, Tiburon offers a variety of activities that belie its small size. 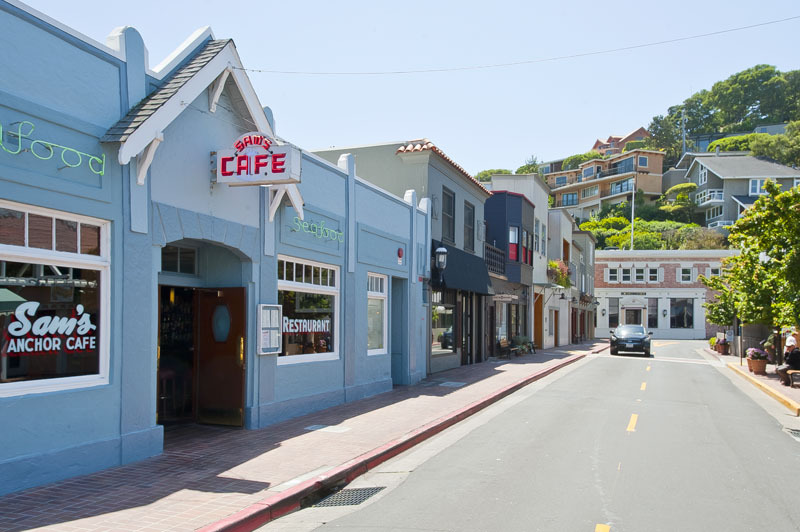 The Tiburon International Film Festival Film brings in films from around the world, there's wine tasting at Windsor Vineyards tasting room, shopping in the elegant boutiques along Ark Row, a leafy block long enclave of tiny shops that were once floating arks, and great restaurants along Tiburon's Main Street. 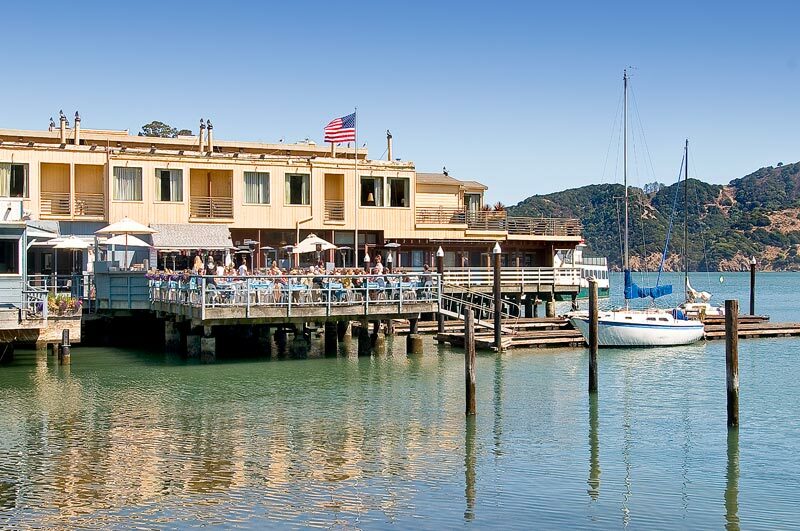 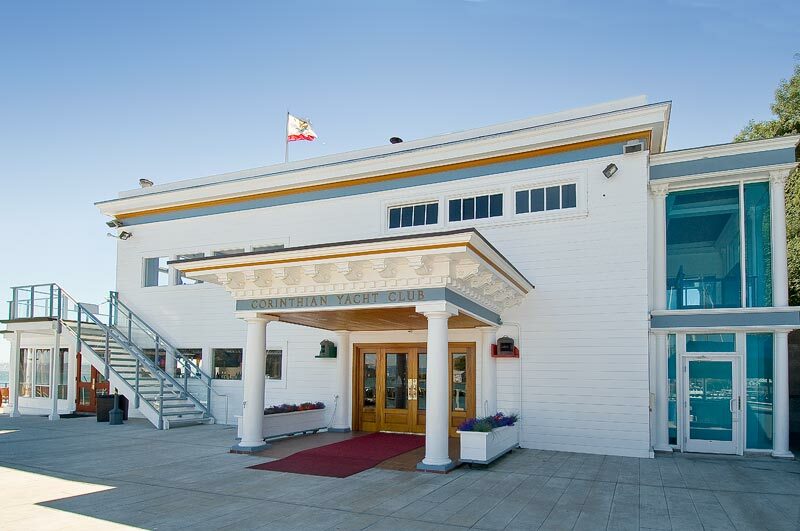 For the nautically inclined, Tiburon's Corinthian Yacht Club is host to Friday Night Races on the bay. 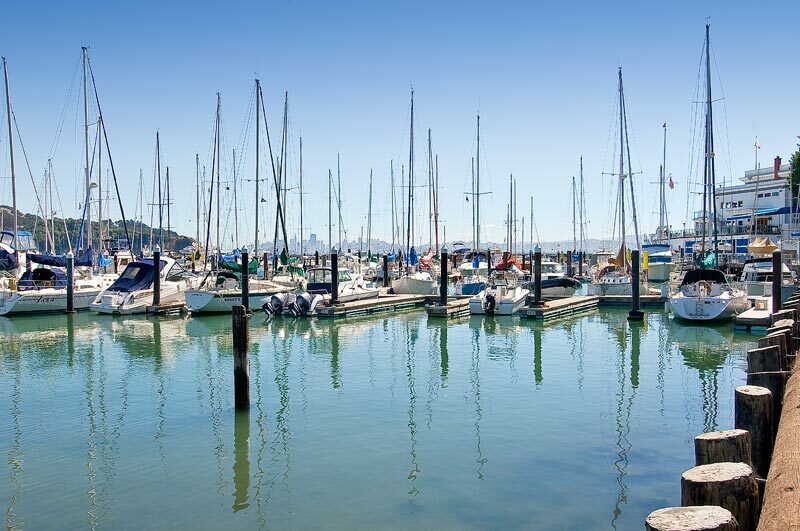 The sight of sailboats, ferries, and ships of every size and shape, is one of the hallmarks of living on the bay, and Tiburon residents enjoy those views from land and sea. 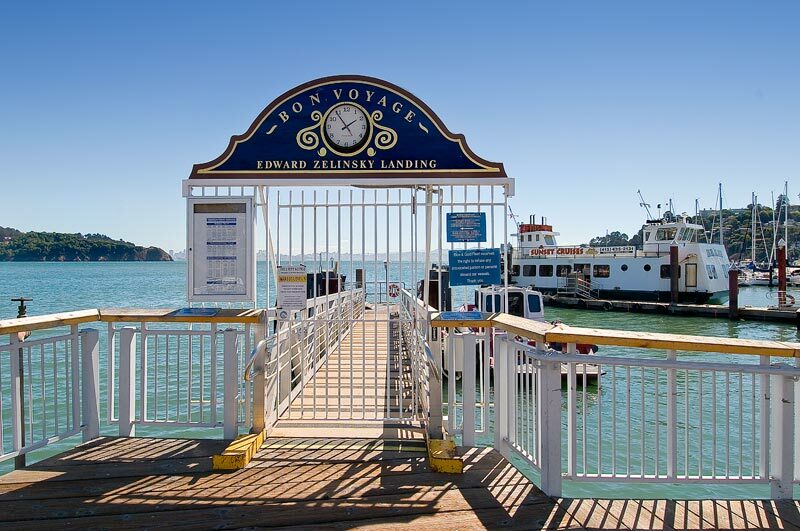 Ferry boats to San Francisco, and Angel Island State Park (with its trails and magnificent views of the City), regularly come and go from the dock at Tiburon’s harbor. 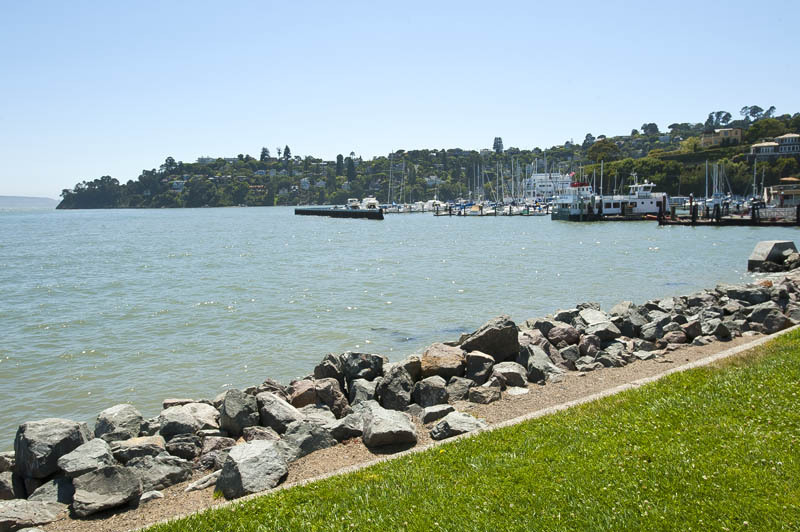 And the town’s many parks are strung out, like pearls on a necklace, along the water’s edge, and atop its highest hills. 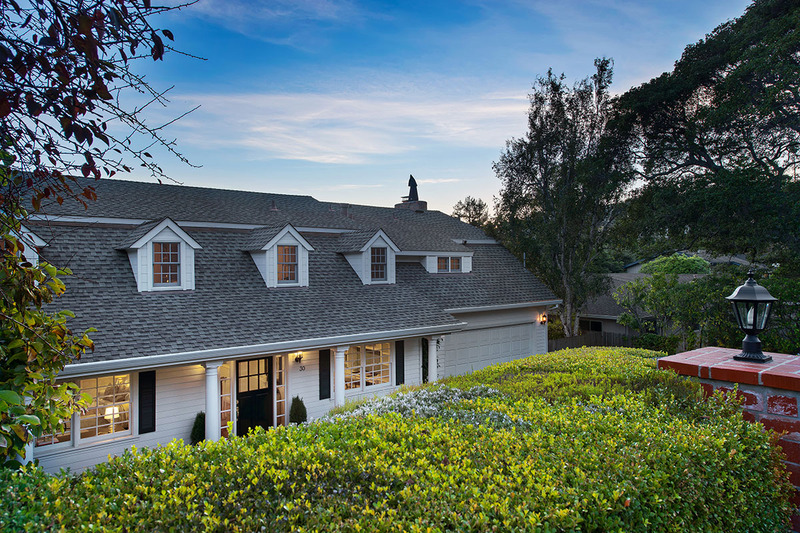 Blackie's Pasture, named after an old swaybacked horse that once lived here, is a popular jumping off spot for hikers, joggers, spandex clad bikers, Moms with strollers, and dog walkers. 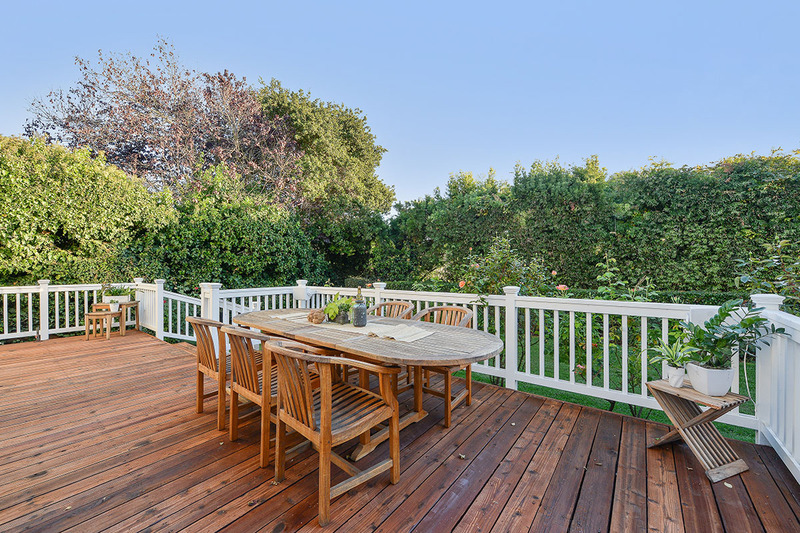 On weekends, the parks fill up with athletes of all ages, in competitive leagues, or informal pick-up games, playing soccer, baseball, basketball, and all manner of sporting activity. 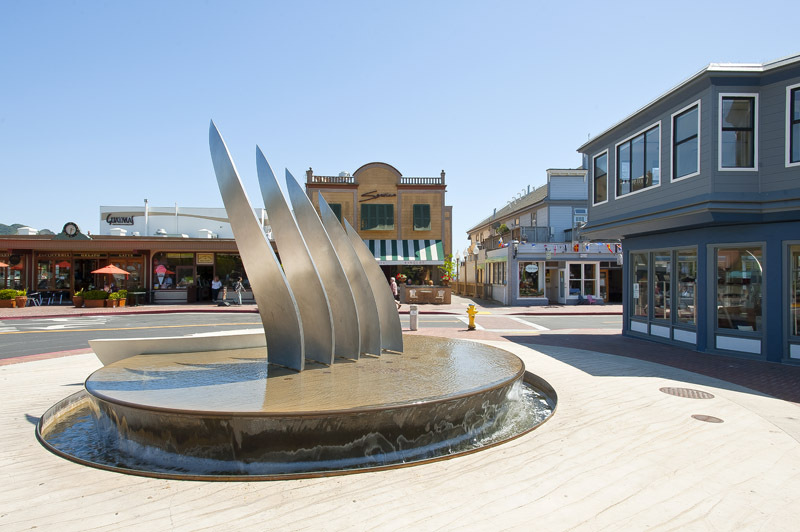 The highly distinguished Reed Union School District, which includes Reed Elementary School (grades K-2), Bel Aire (grades 3-5), and Del Mar School (grades 6-8), is among the most recognized in the state, for its award winning academics, and cutting edge technology, as well as for its outstanding community involvement and fundraising efforts that benefit the arts, sports, and foreign language education. 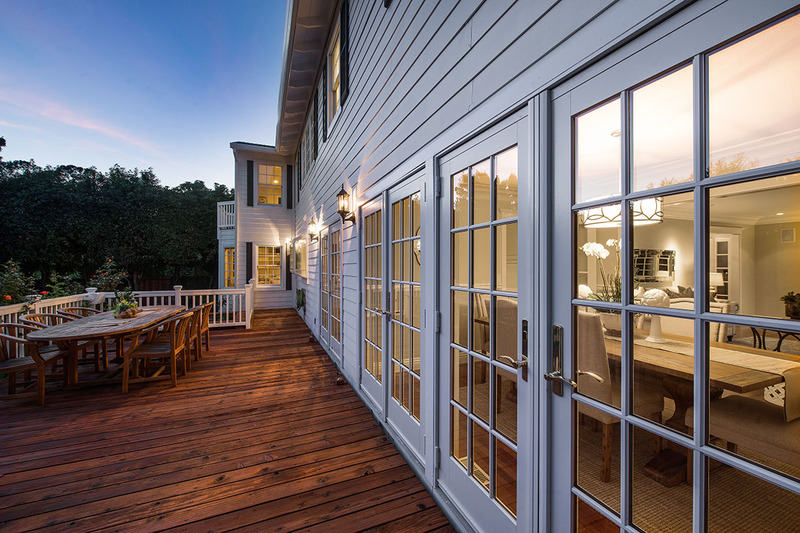 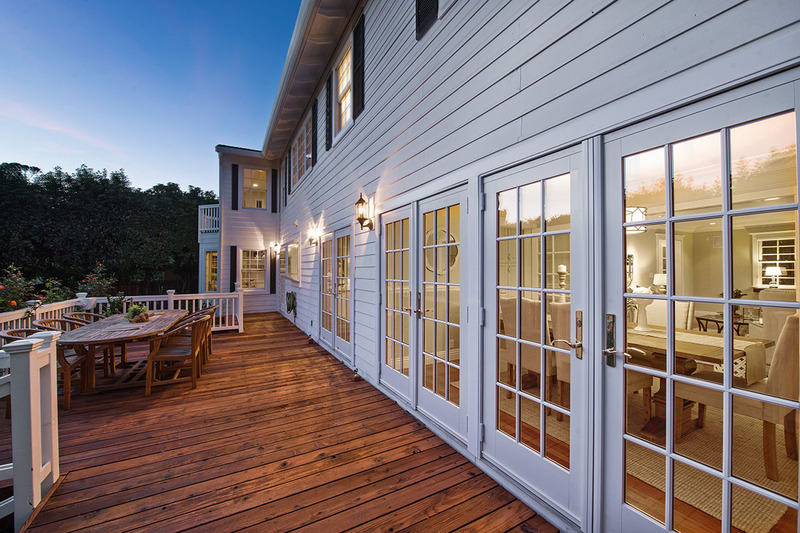 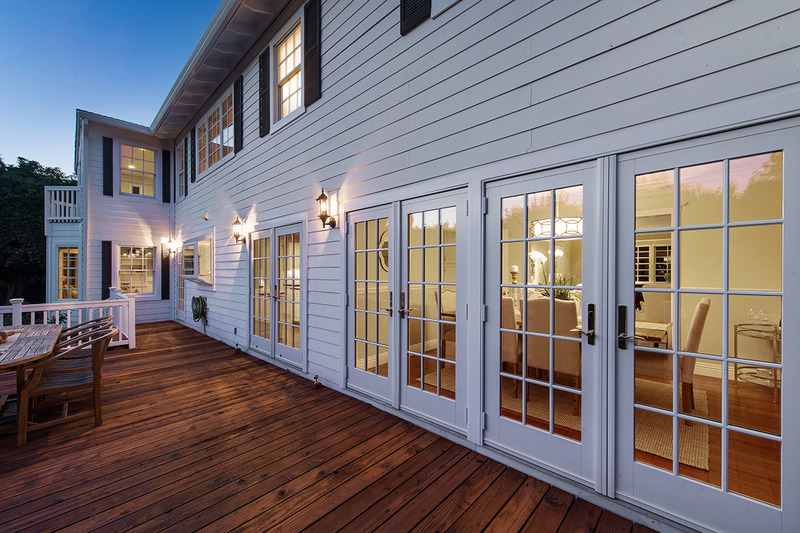 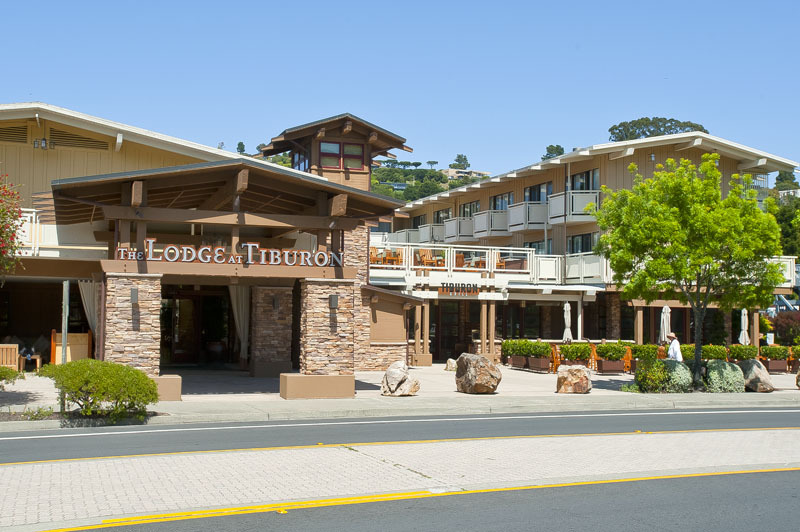 All these things, and more, make Tiburon a truly wonderful place to call home.